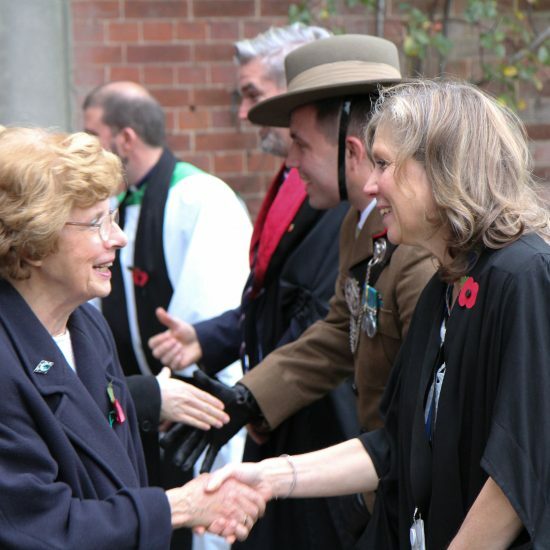 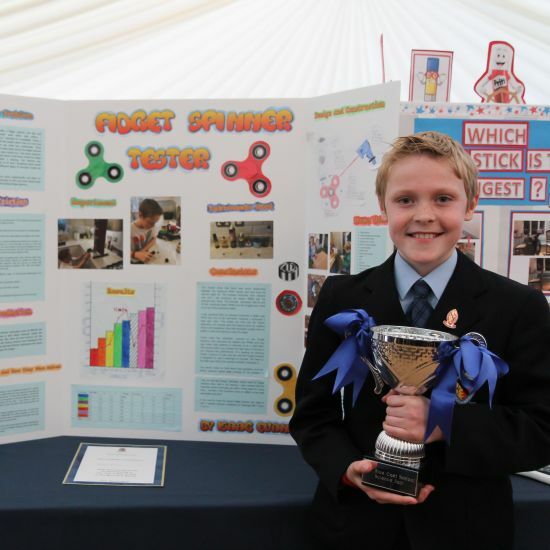 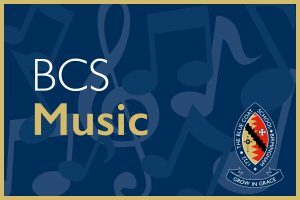 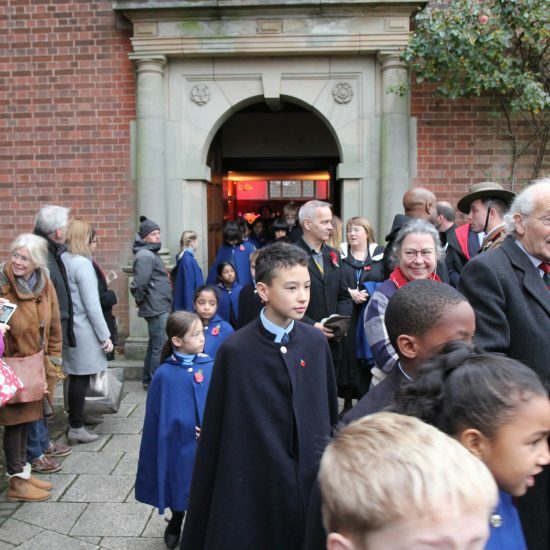 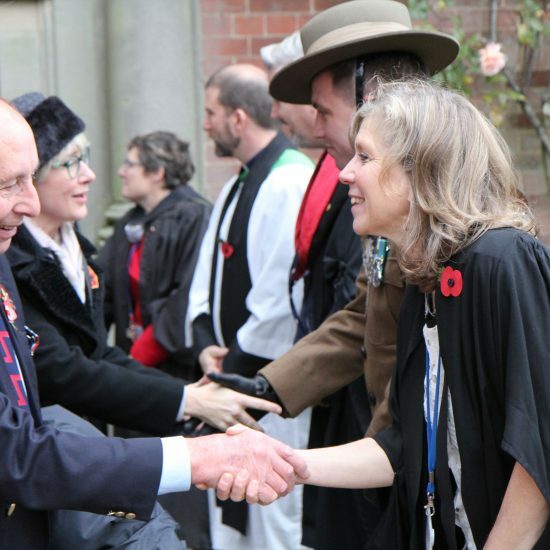 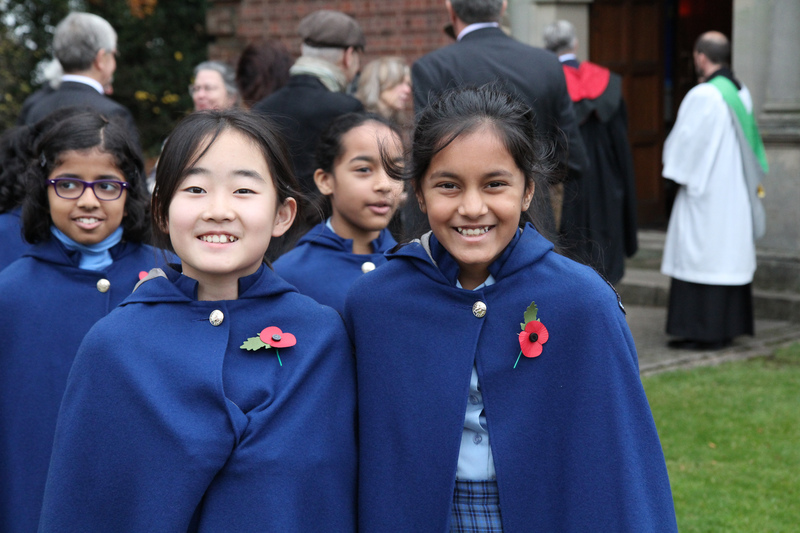 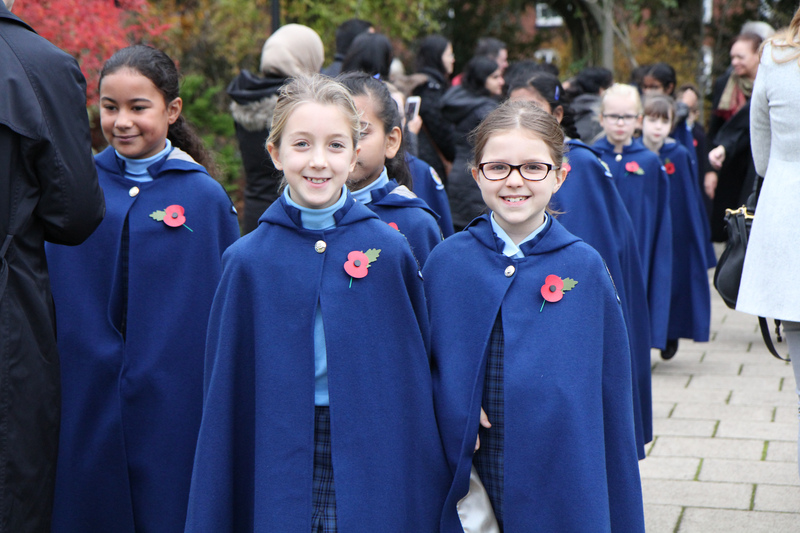 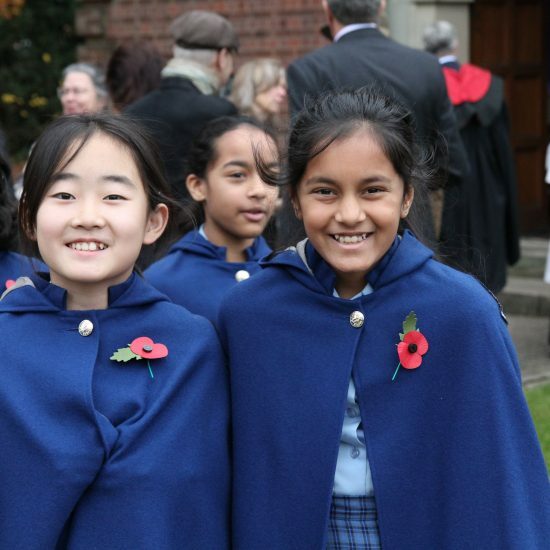 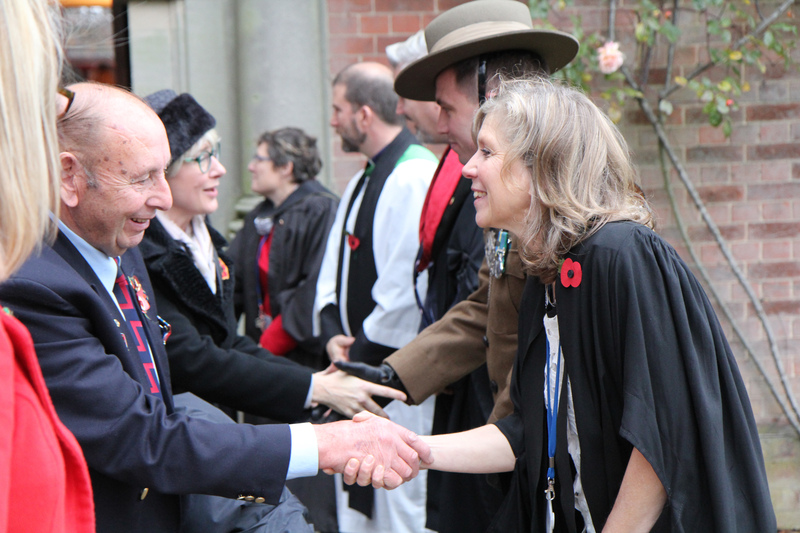 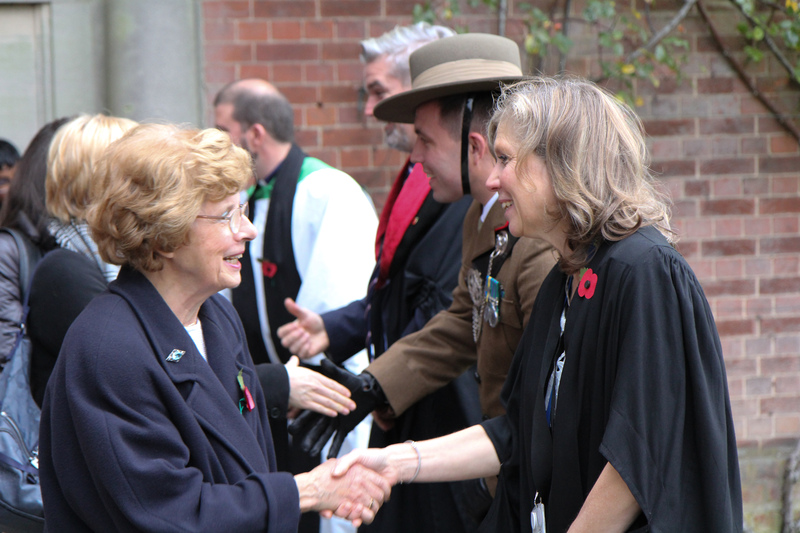 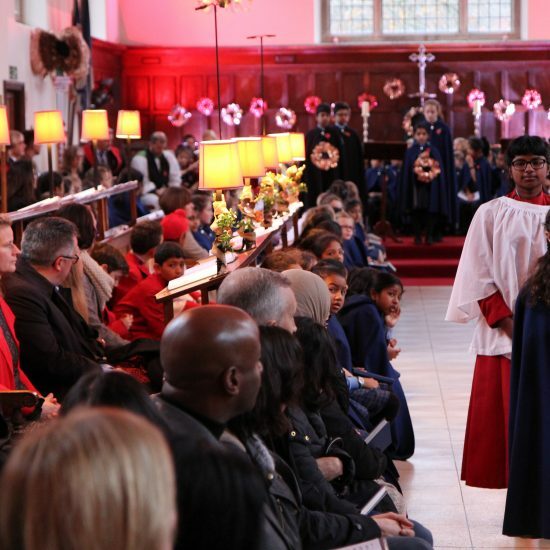 It has been a moving week of commemoration at Blue Coat. 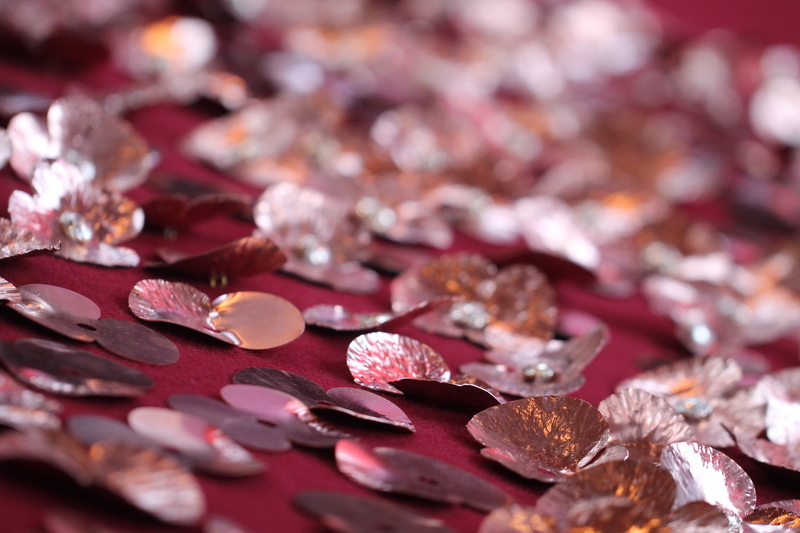 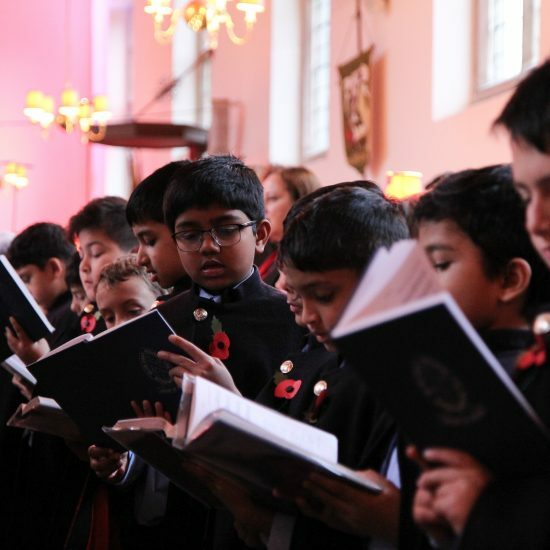 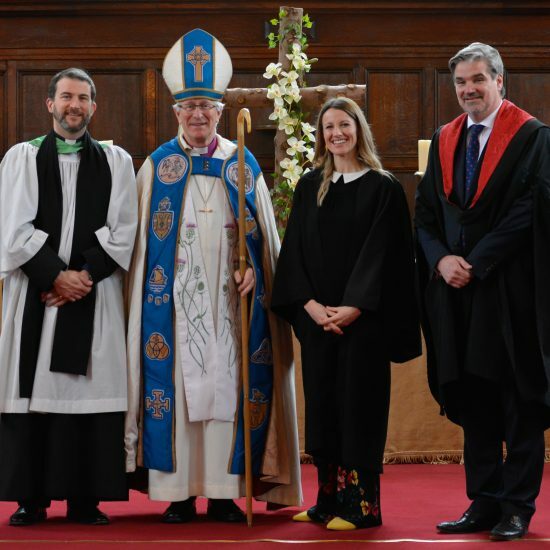 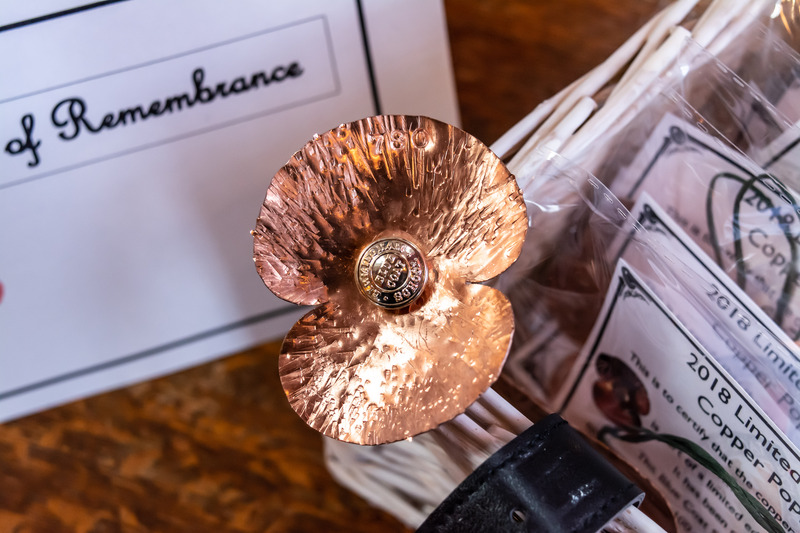 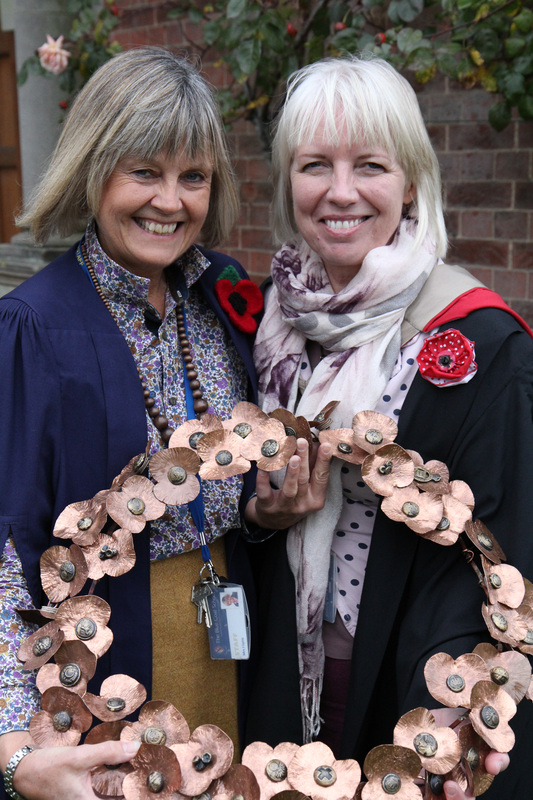 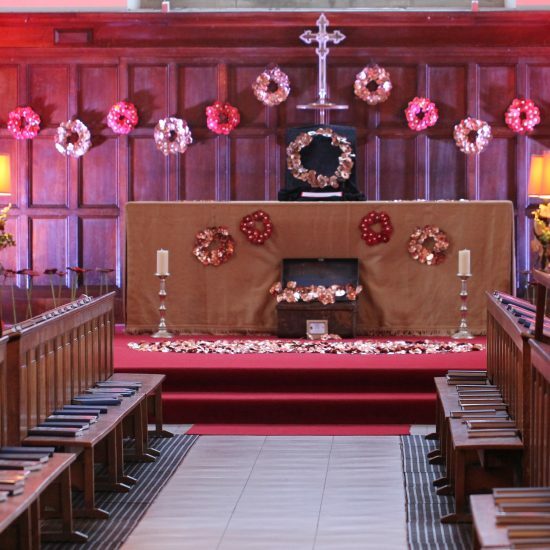 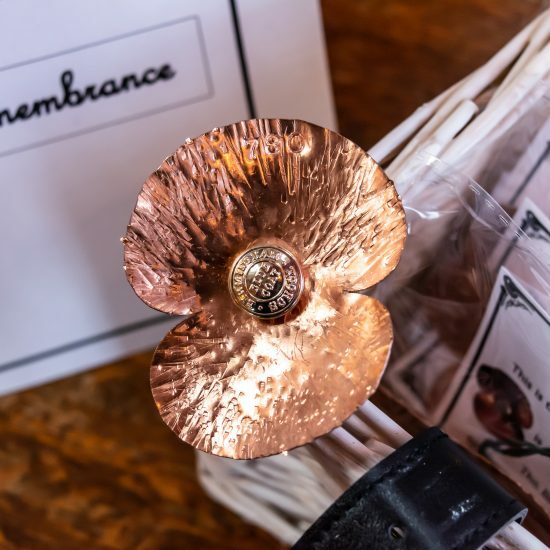 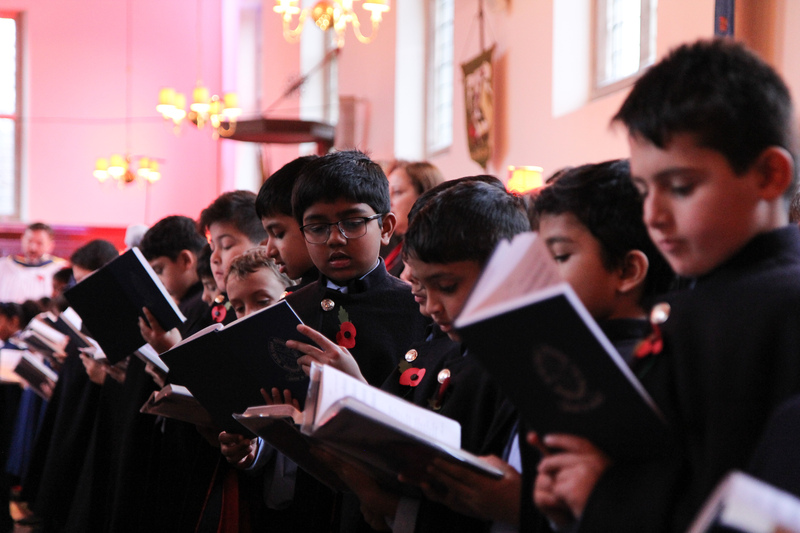 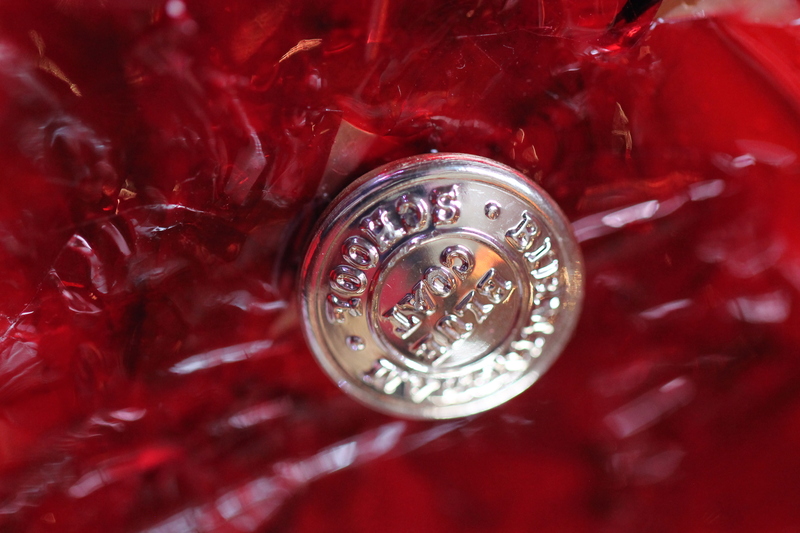 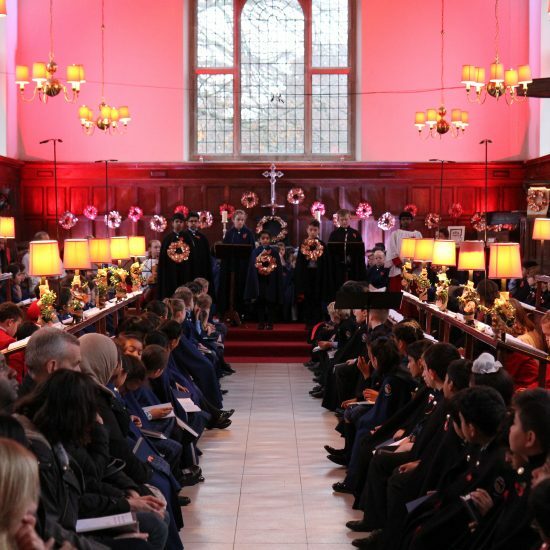 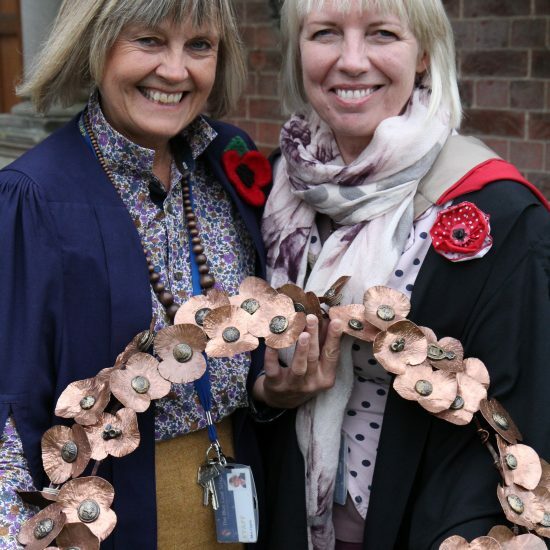 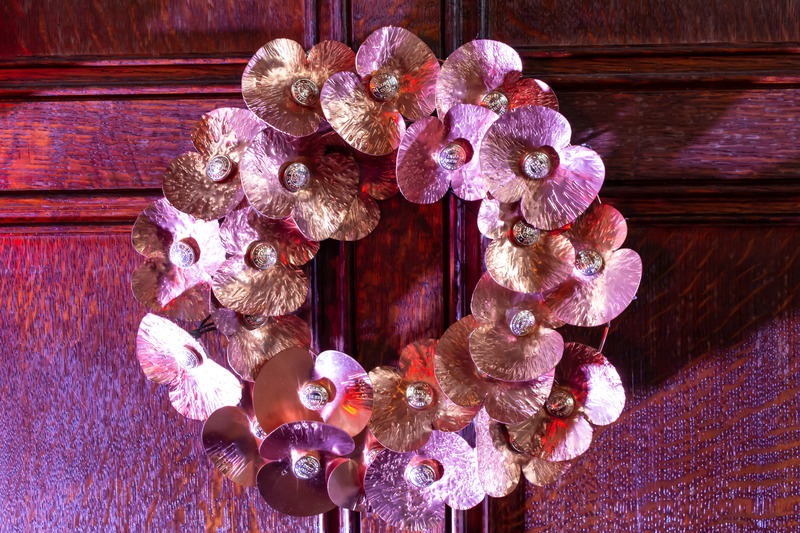 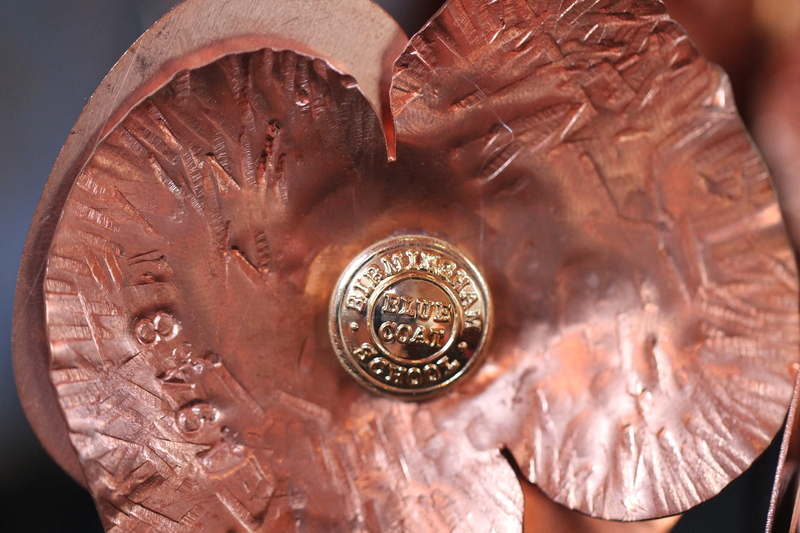 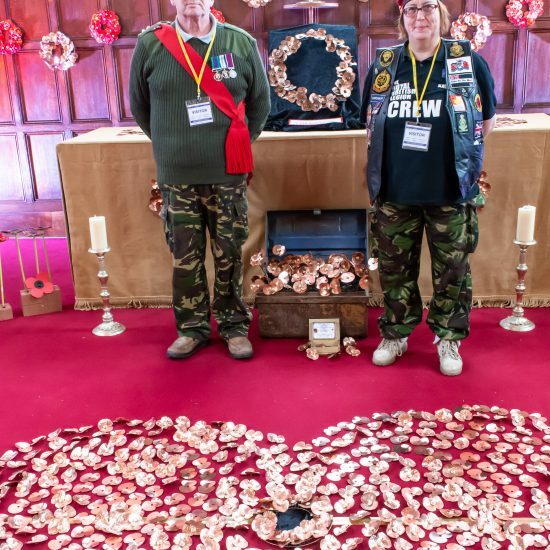 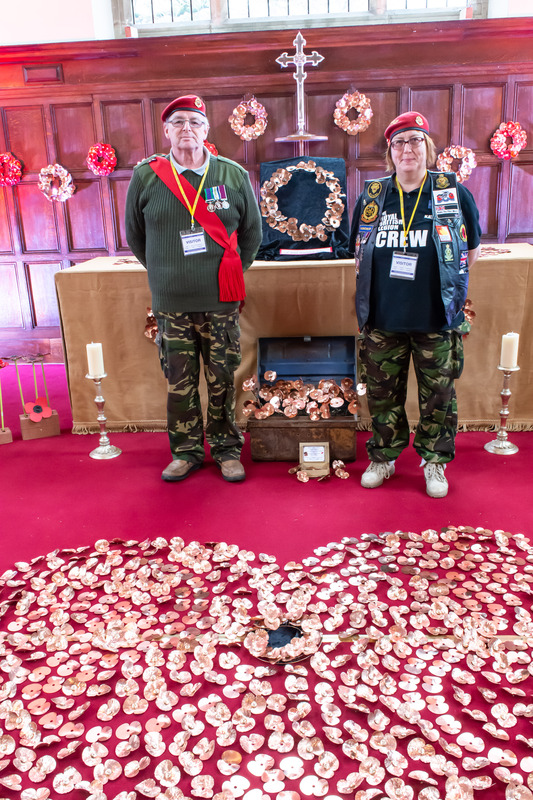 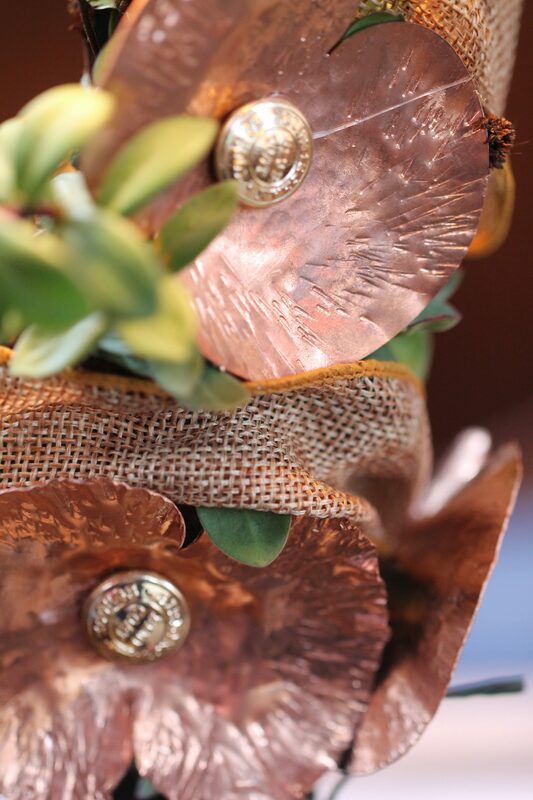 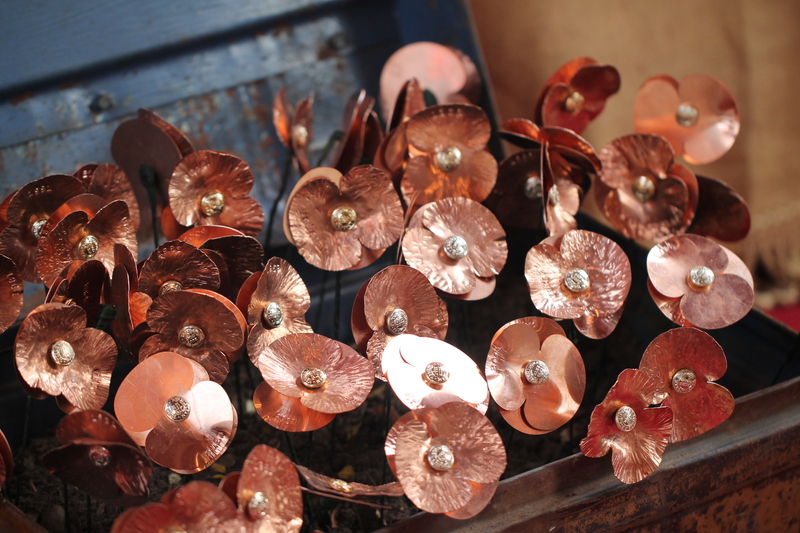 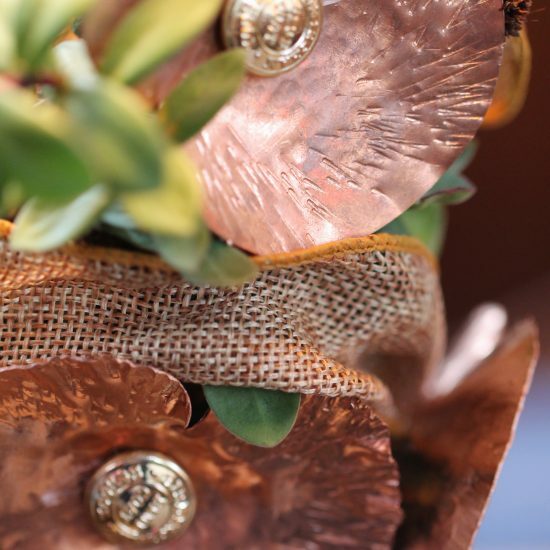 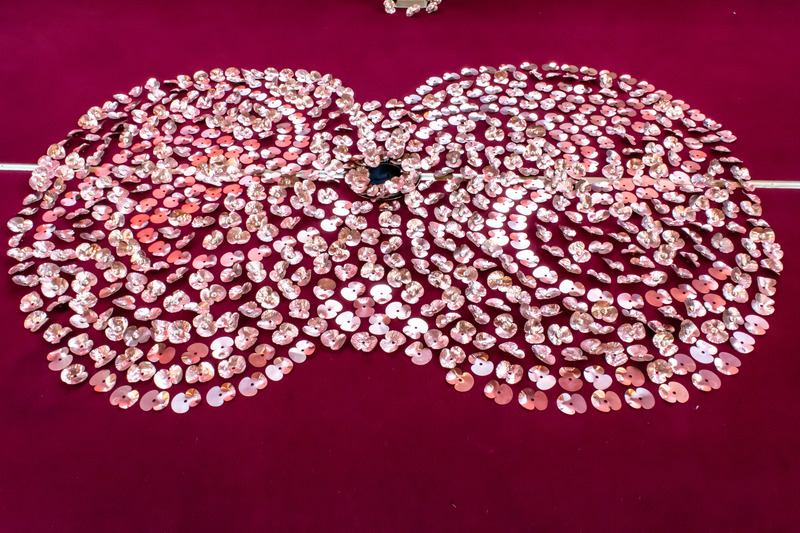 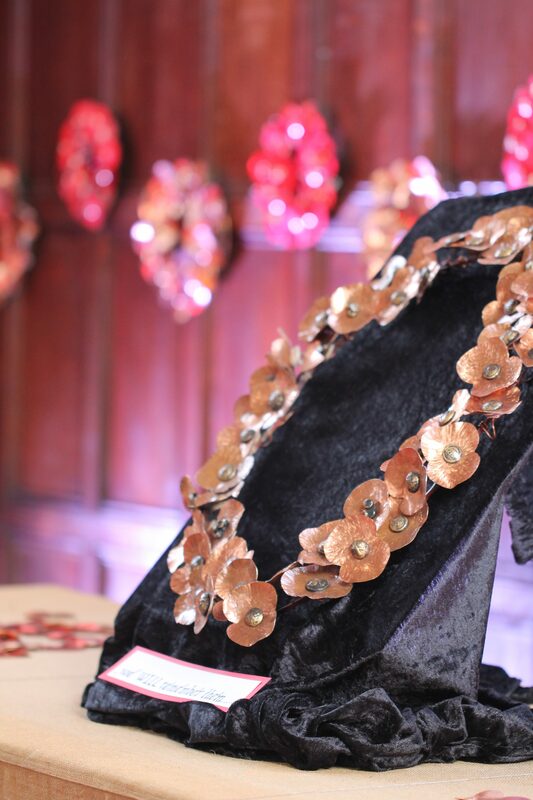 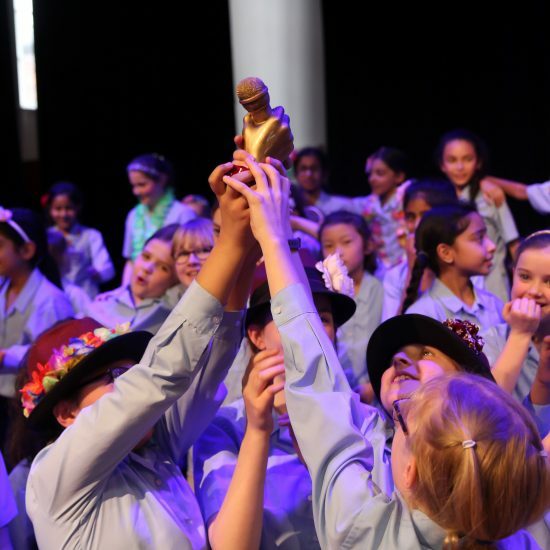 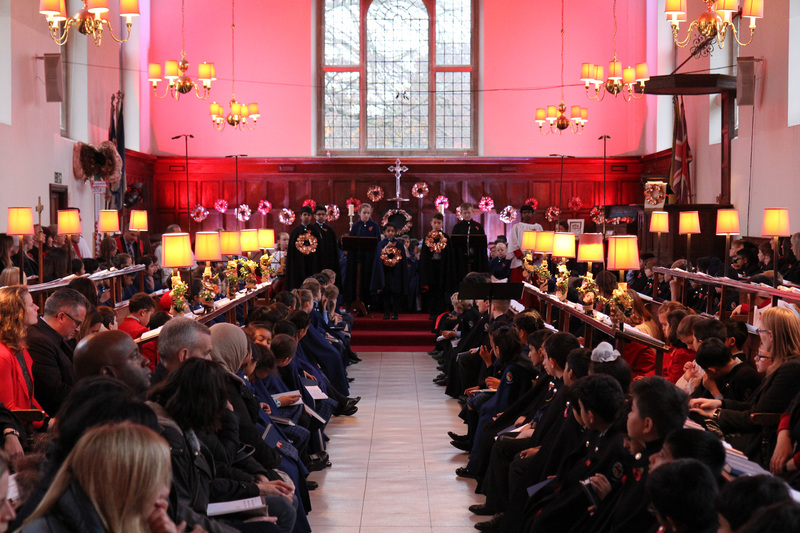 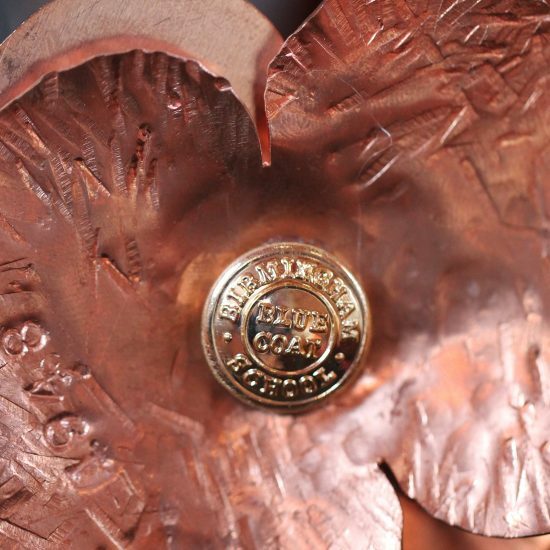 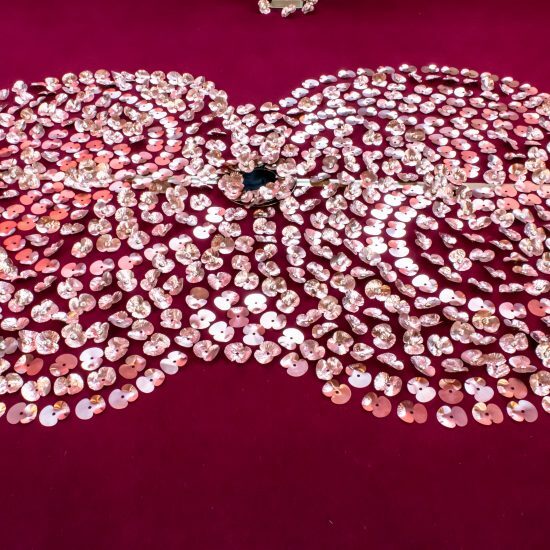 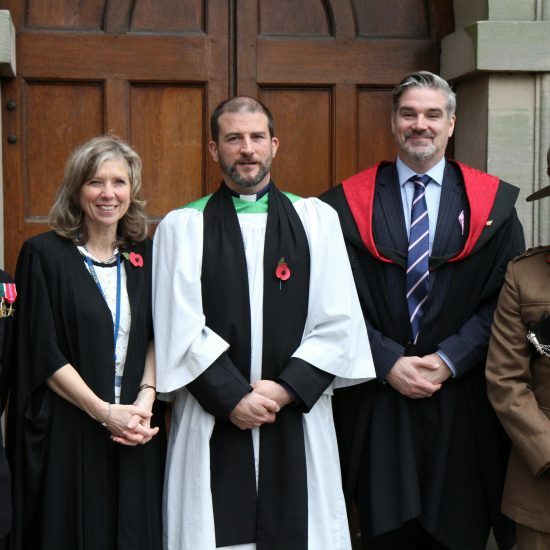 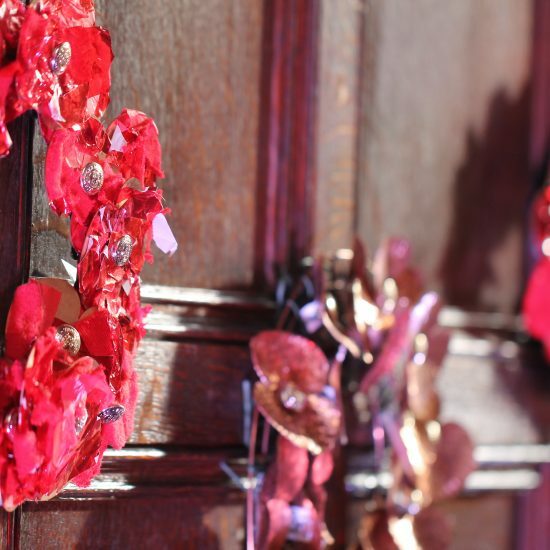 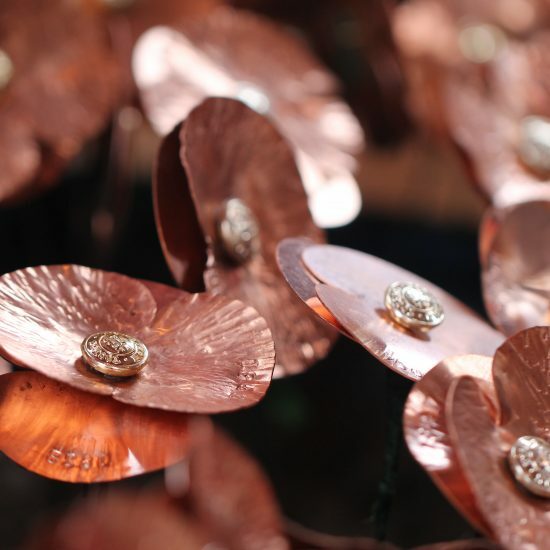 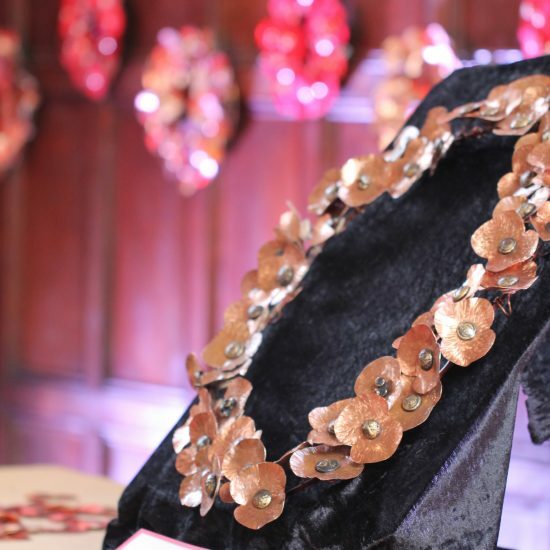 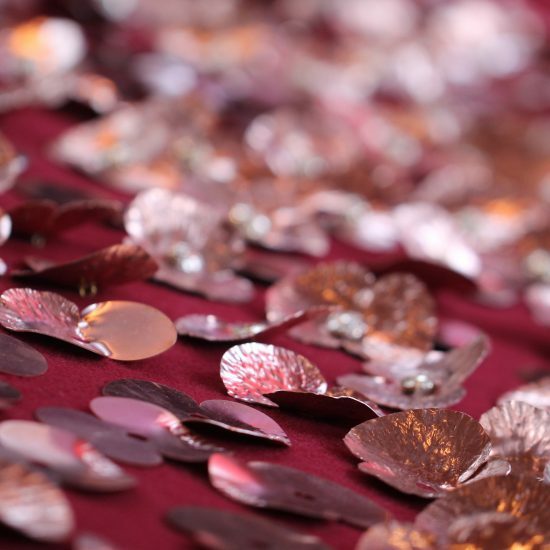 The commemorative installation of the Copper Poppy Centenary Project in the School Chapel marked the culmination of a great deal of hard work from the Creative Arts department. 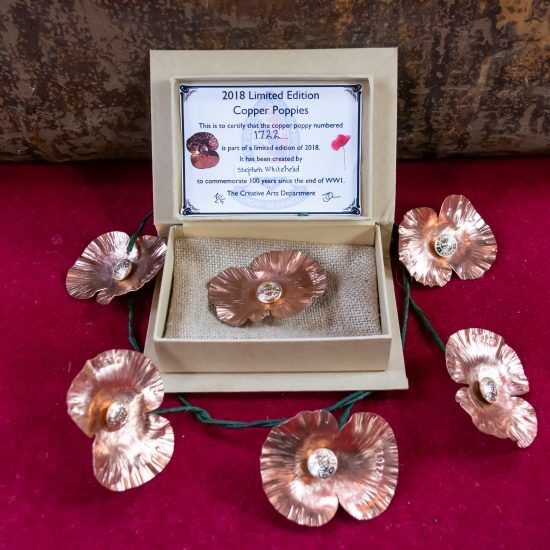 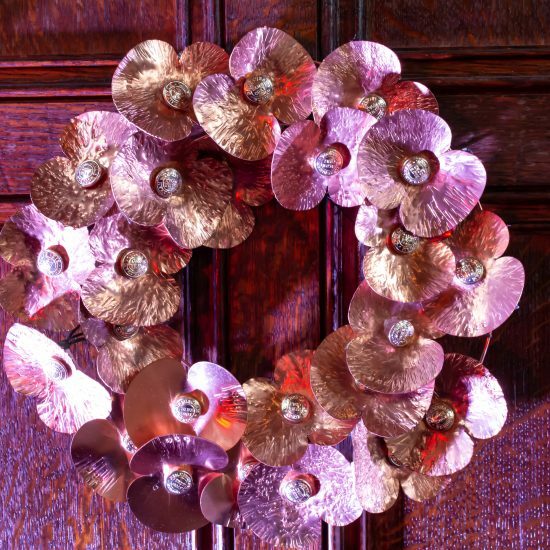 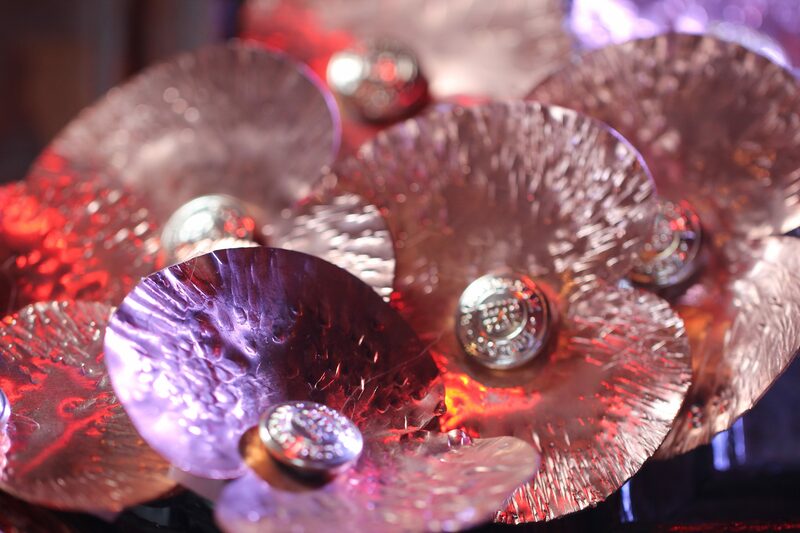 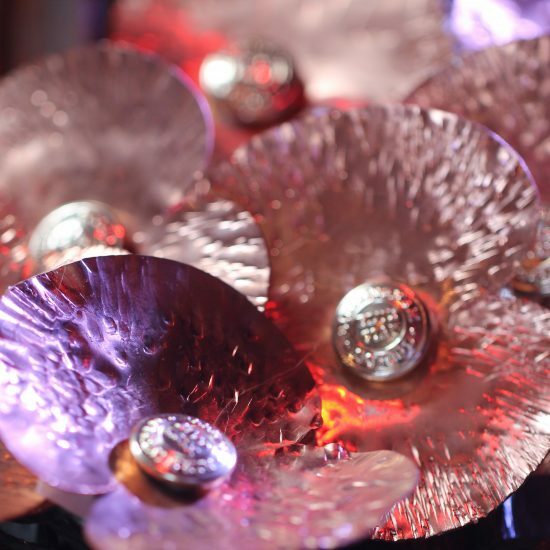 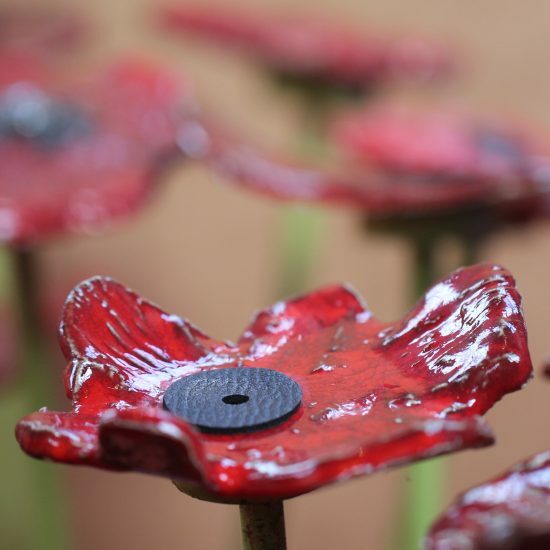 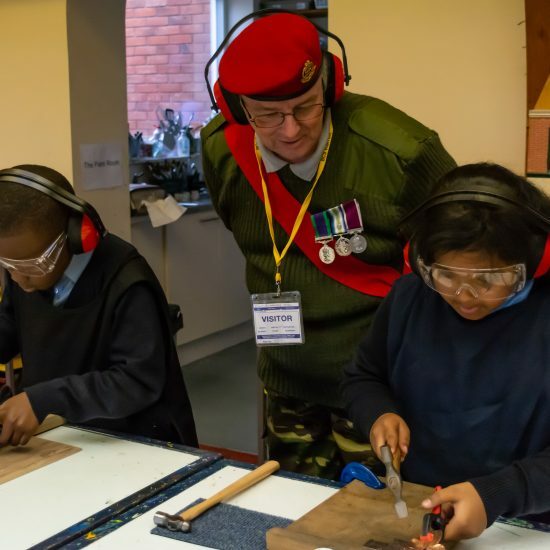 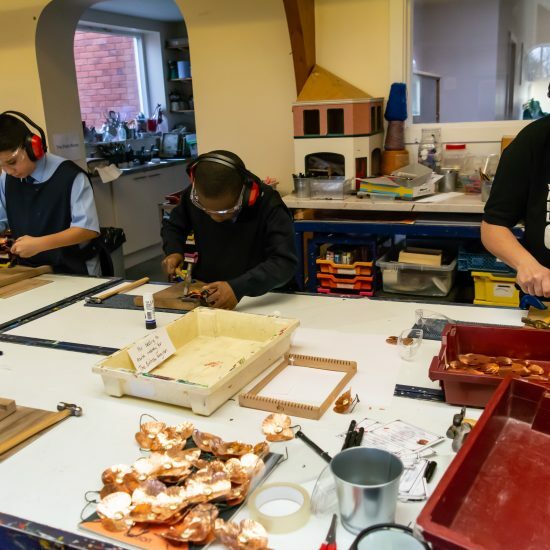 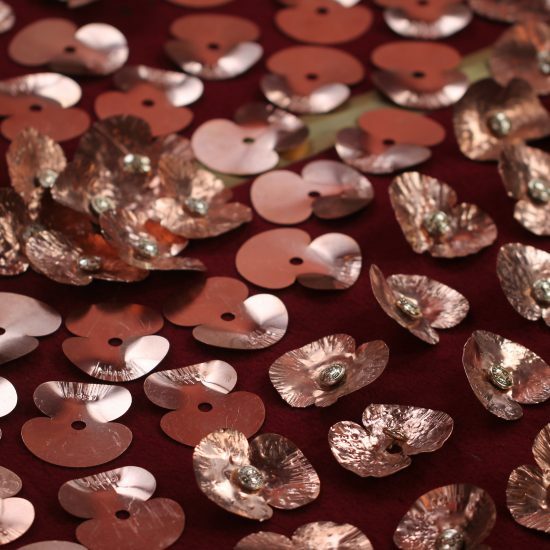 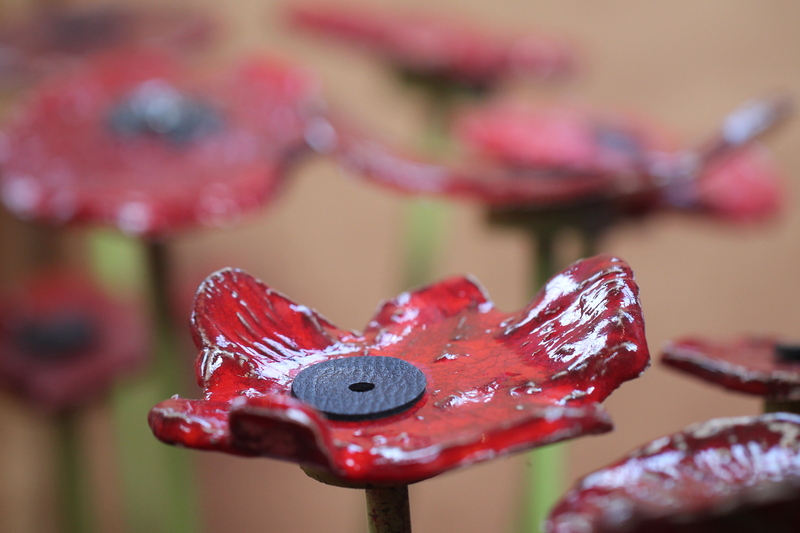 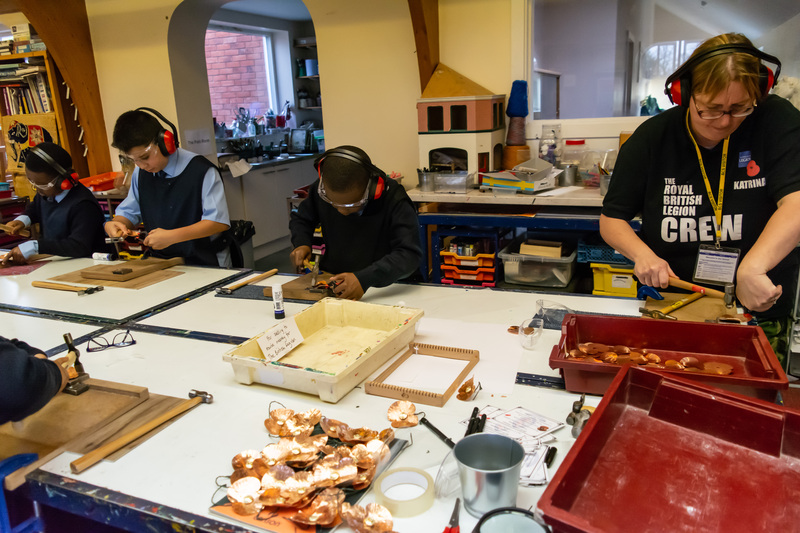 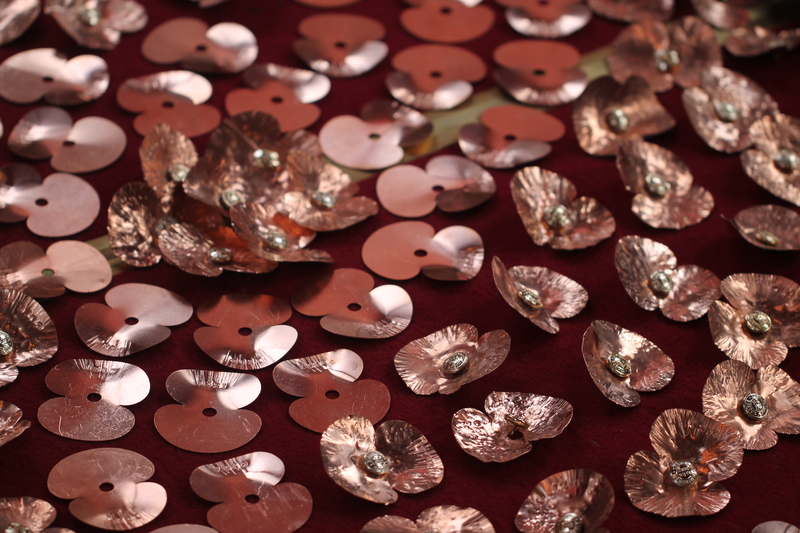 Working with Artist-in-Residence Stephen Whitehead of Countershade CIC, children, staff, parents and old scholars have been ‘bashing’ 2018 copper poppies to mark one hundred years since the end of the First World War. 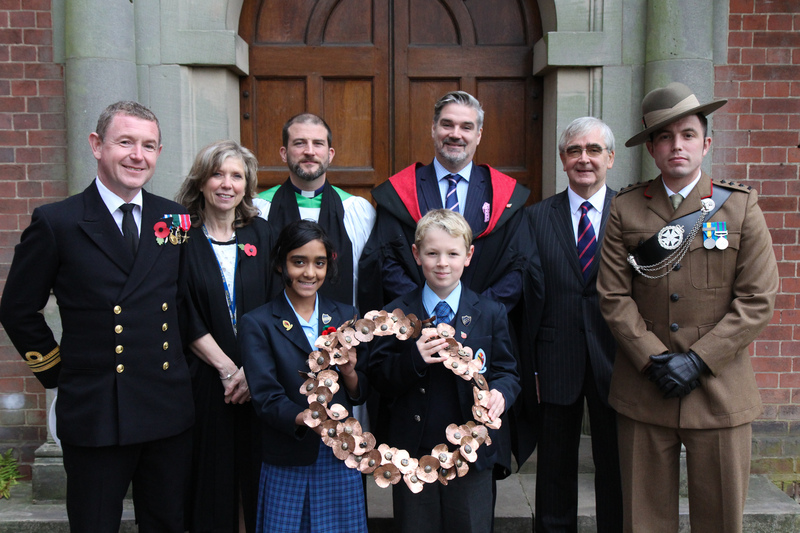 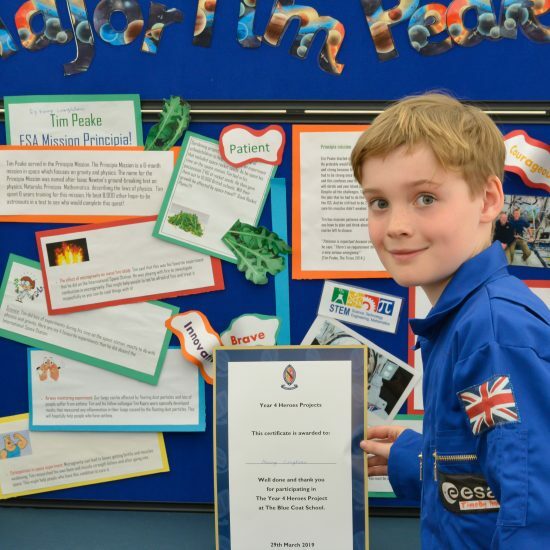 Stephen shared his collection of world war memorabilia with pupils as well as the School’s Roll of Honour, which was drawn up in 1915 by the Governors of the day, to remember 109 Blue Coat pupils who fought in the first half of the Great War. 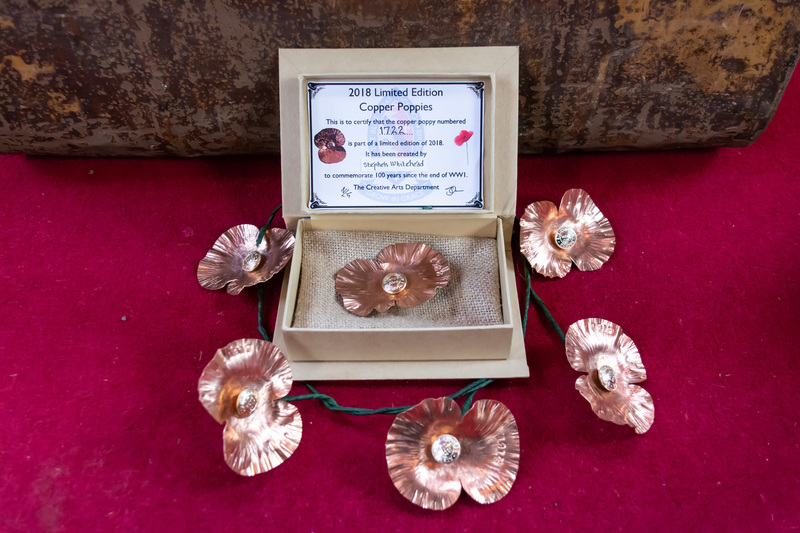 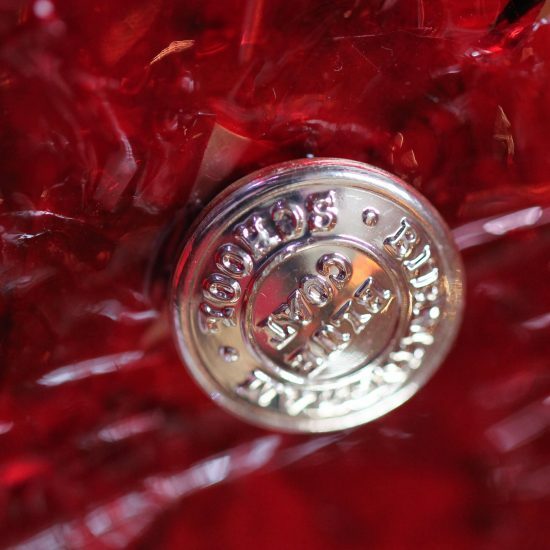 Back in October, Mr and Mrs Neeson were the first to don goggles and ear defenders before taking up the hammer to strike at the copper form and produce the first limited edition poppy, complete with a Blue Coat silver button at its centre. 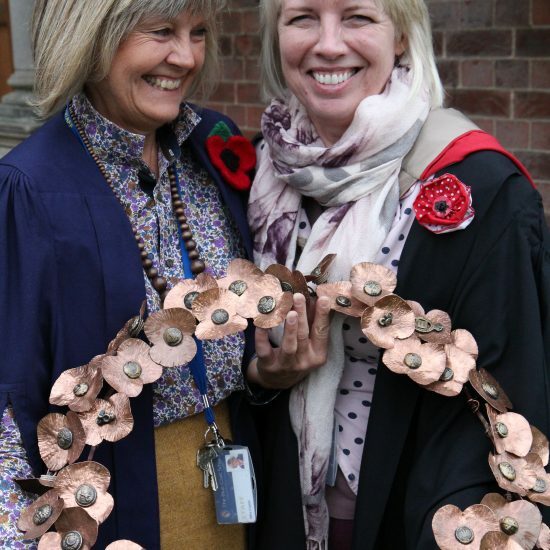 This demonstration was followed by several industrious weeks in which the whole school community worked together, recording their progress on a giant Poppy-o-meter as they endeavoured to form as many of the 2018 cut-outs as possible in the run up to Remembrance Day. 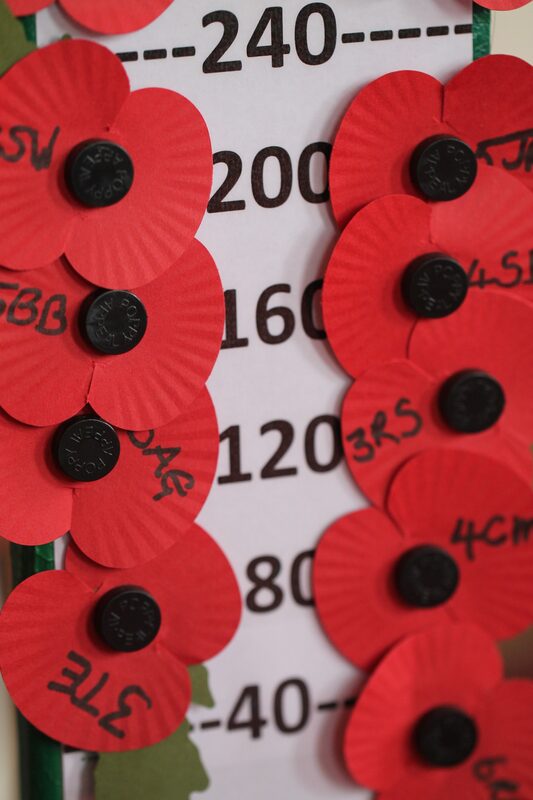 The children are now all able to keep a poppy as a reminder of those who served for their country. 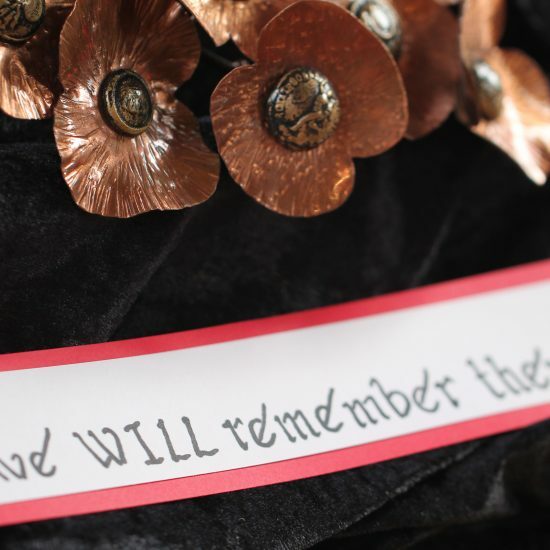 The poppies are also being sold, with their certificates of authenticity, to friends and family, raising money for The Royal British Legion. 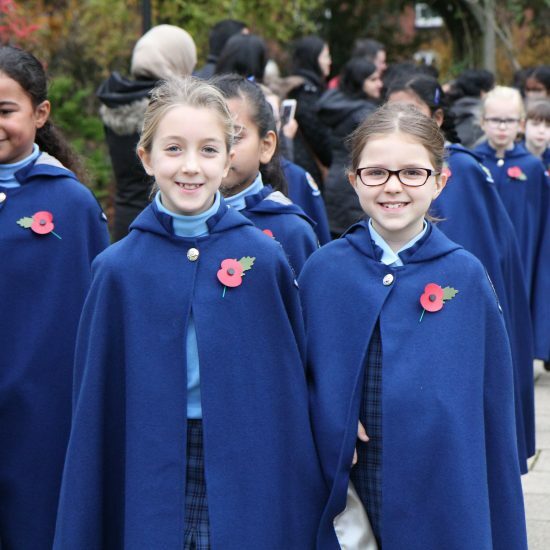 Poppy number 1722 of 2018, which is the date of the foundation of The Blue Coat School, Birmingham, joined other tributes to the fallen in Tyne Cot Cemetery, Belgium. 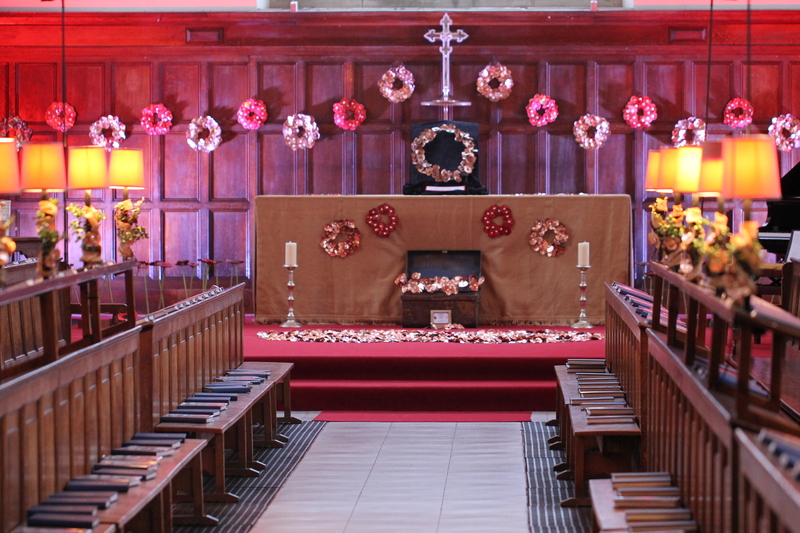 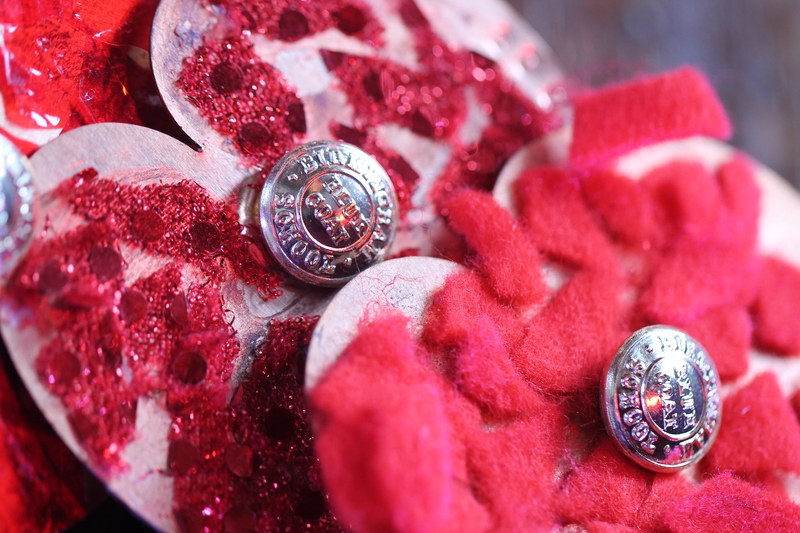 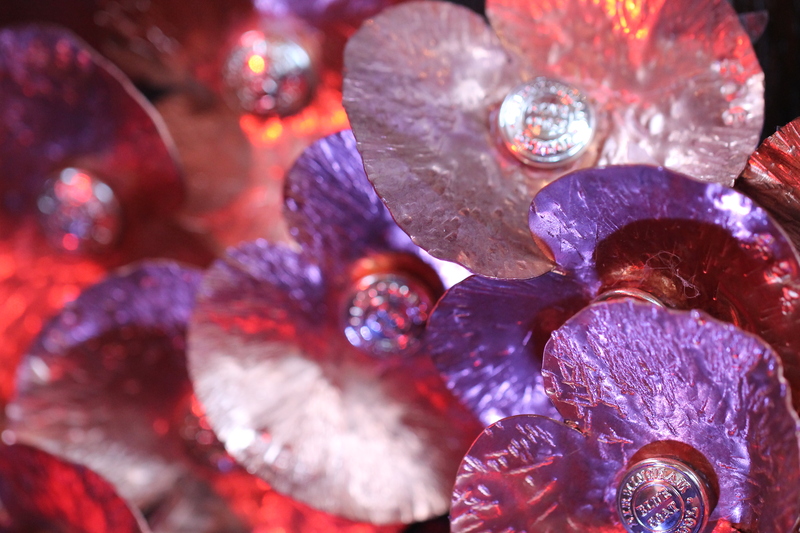 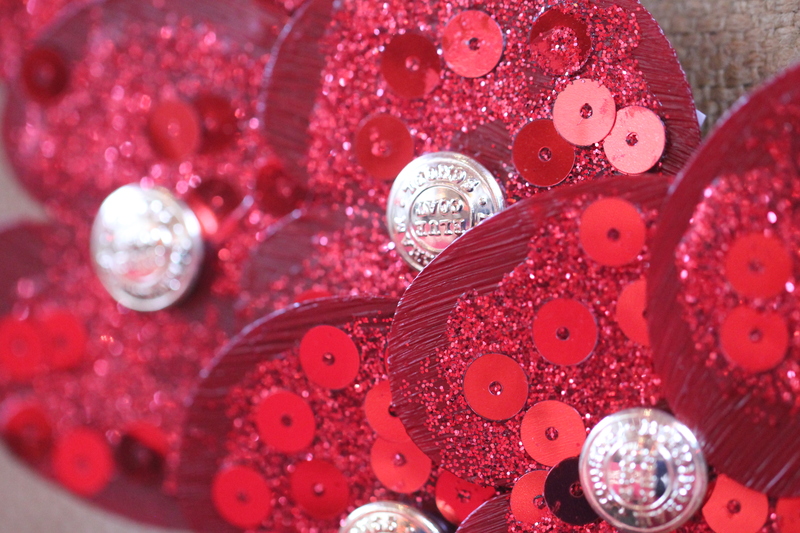 The children were delighted to see other copper poppies were also amongst the commemorative wreaths that lie there. 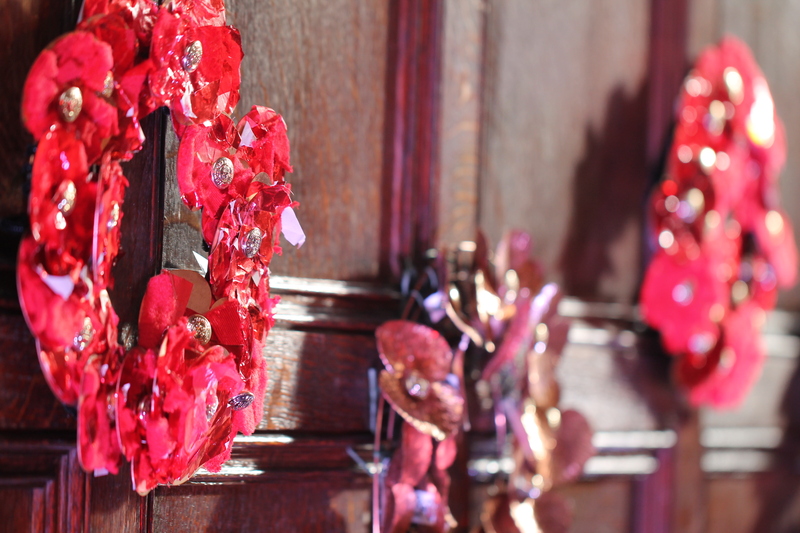 The children have all enjoyed having a chance to visit the installation in their classes. 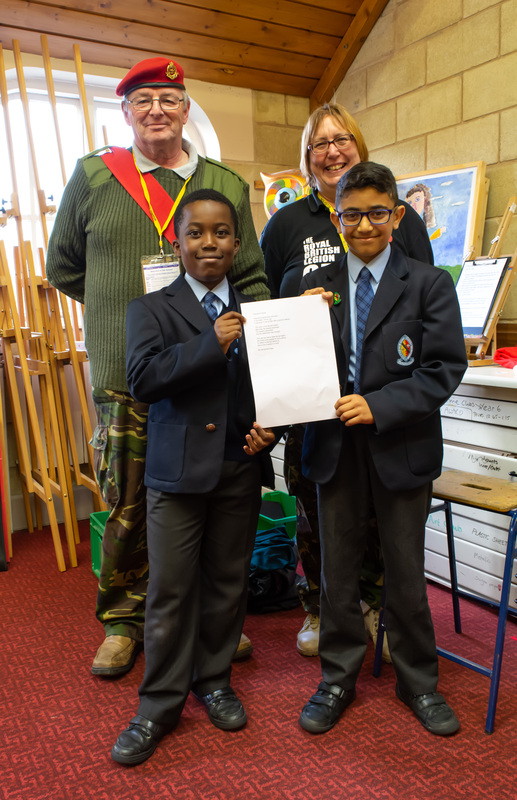 As well as writing messages in the book of Remembrance, some of the pupils took inspiration and wrote some very moving poetry in their English lessons. 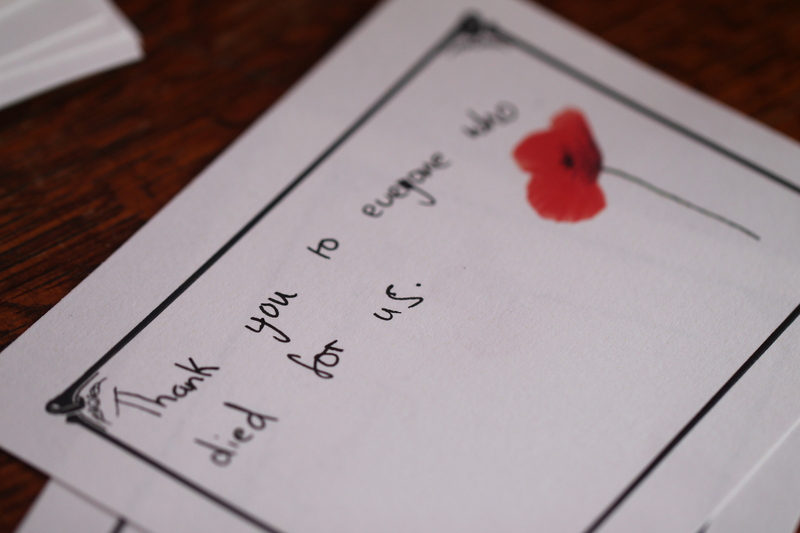 Lives given to set us free, War is gone for eternity. 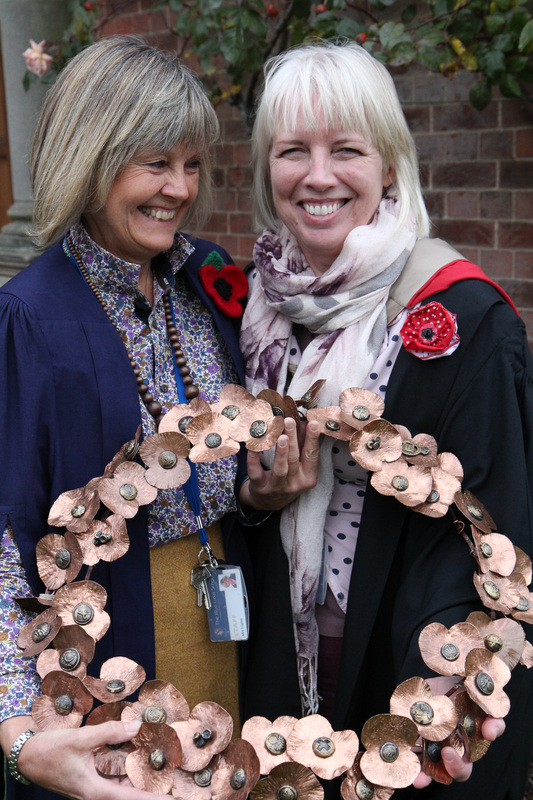 And the relationship was mended. 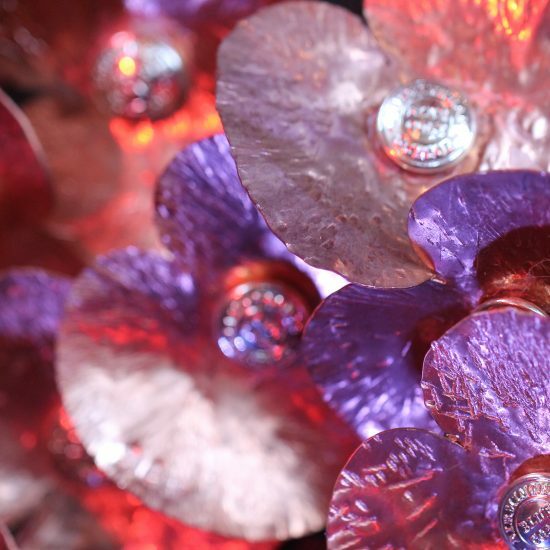 Now to live in peace is a must. 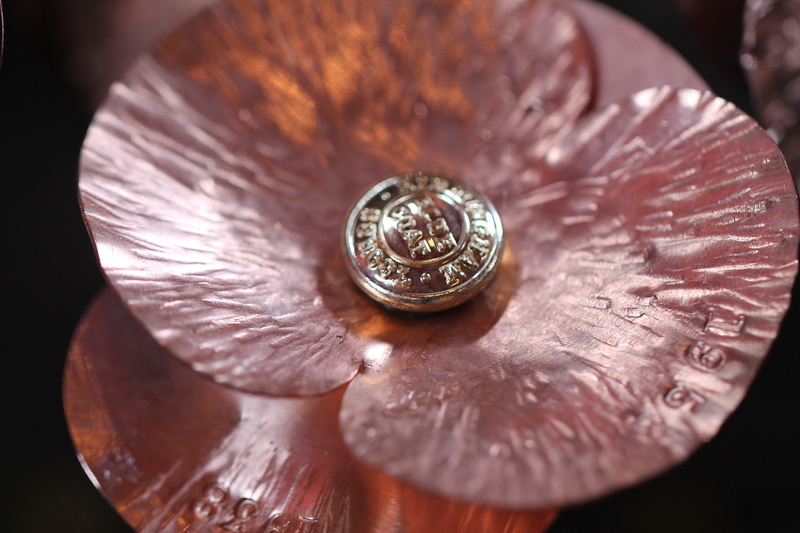 You are the heroes of World War One. 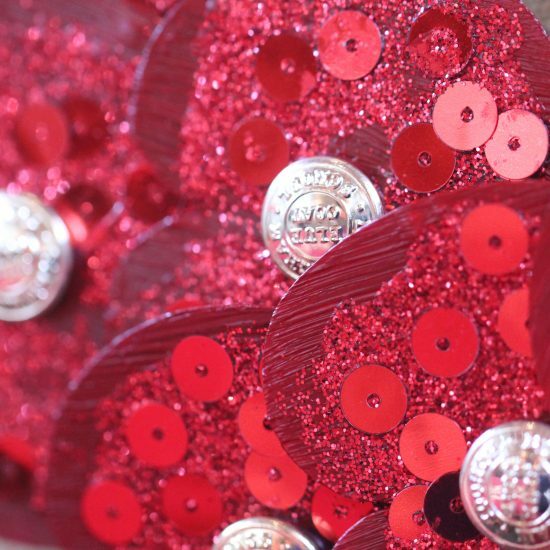 Because of you peace has won. 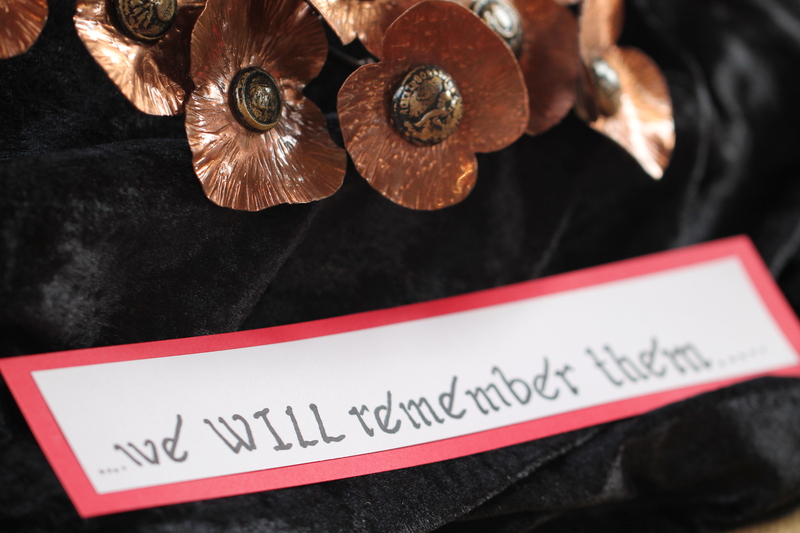 So you could fight for all mankind. 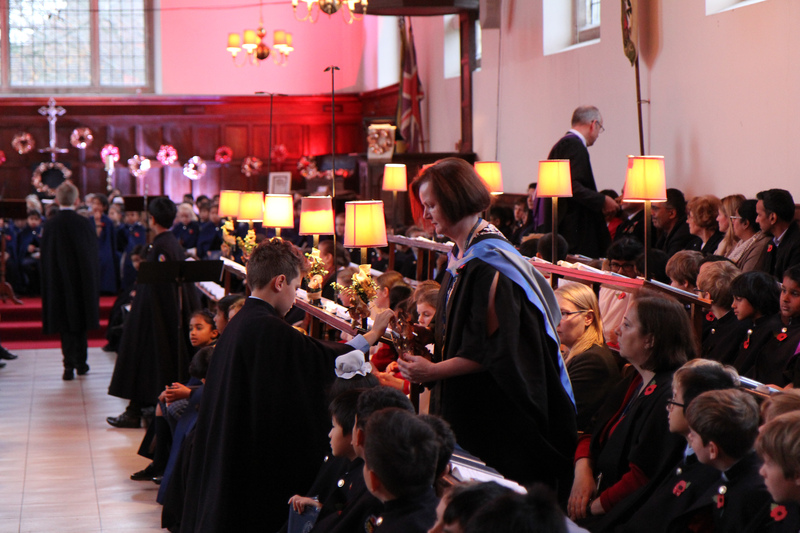 As you fought with fearless attitude. 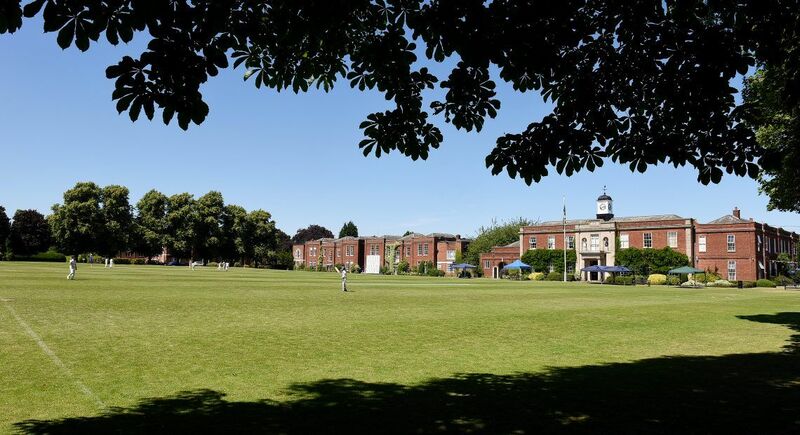 So that I could live here peacefully. 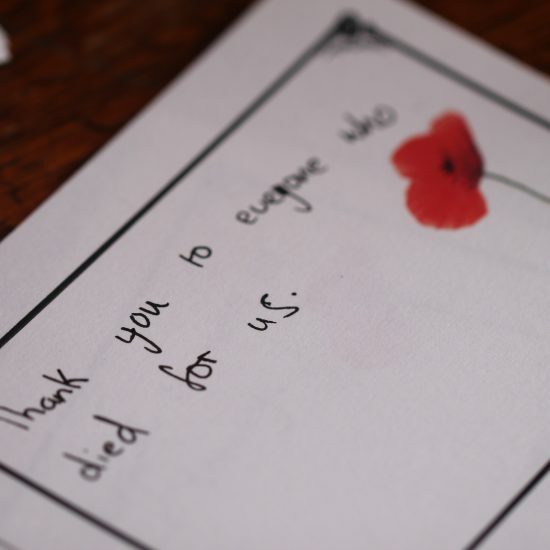 Because of you war has gone. 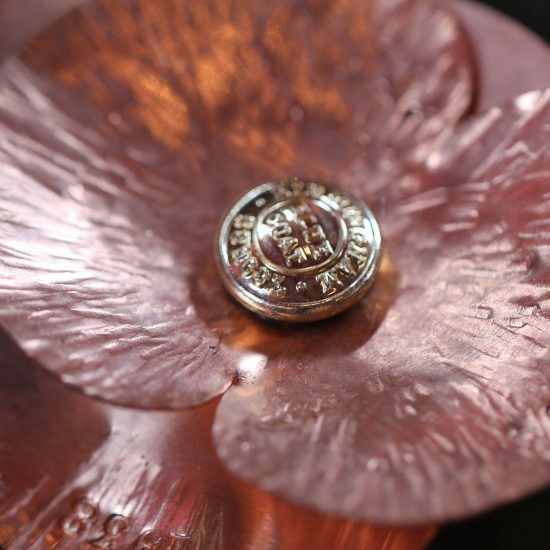 For this we shall never forget. 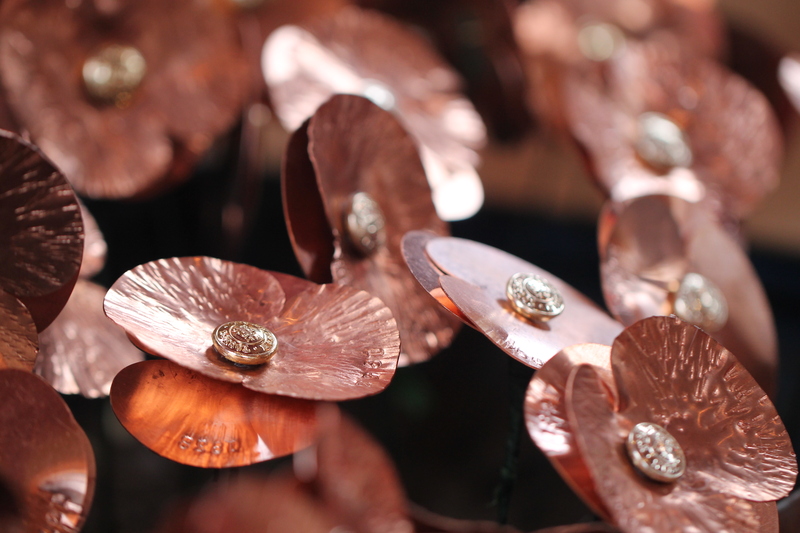 I am grateful to the brave men and women who worked together to change our world forever. 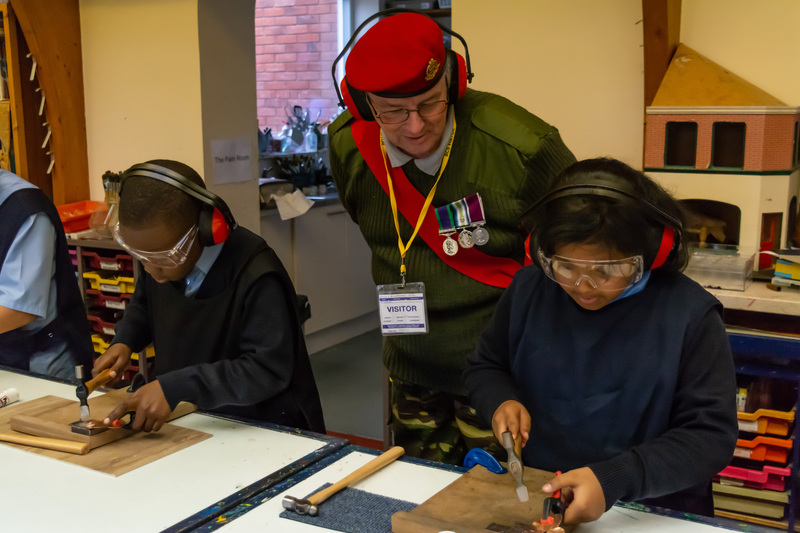 Alan Woodland, Staff Sergeant, Royal Military Police and Katrina Hutton, Deputy Poppy Appeal Officer from the Royal British Legion, joined us to view the installation on Thursday and were delighted to participate in 5BB’s Art lesson where they saw the children making more poppies, They even had a turn too! 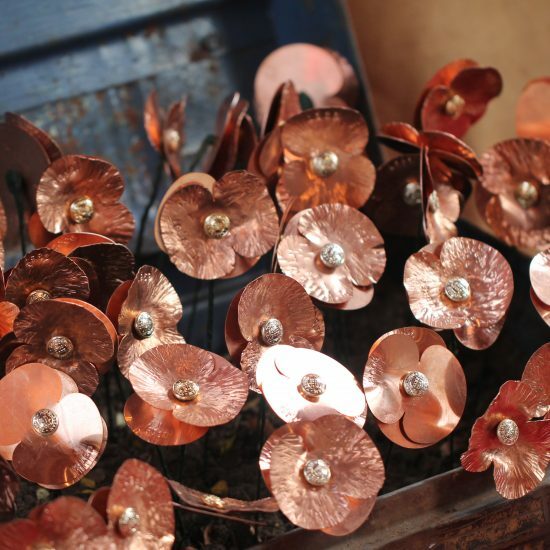 They were so impressed with the children’s knowledge about Remembrance and will be sharing the Blue Coat’s Copper Poppy Project in the Royal British Legion magazine which goes all around the world. 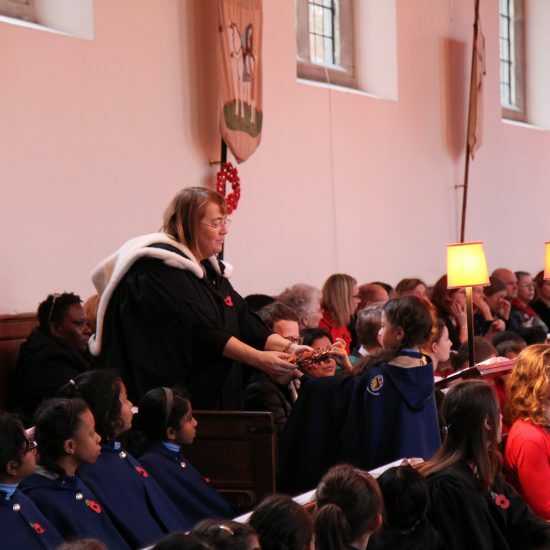 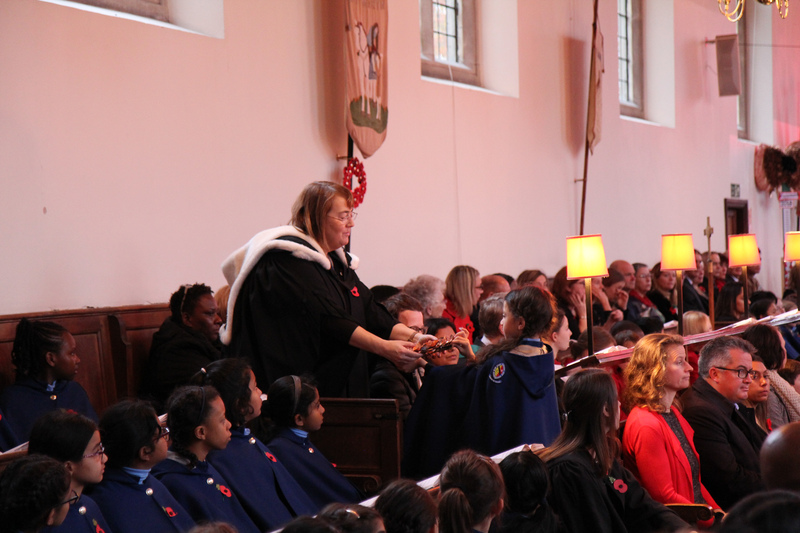 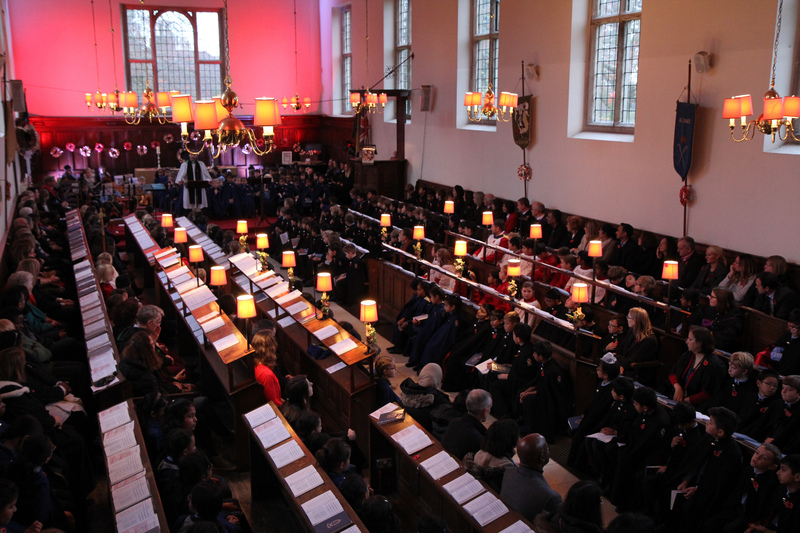 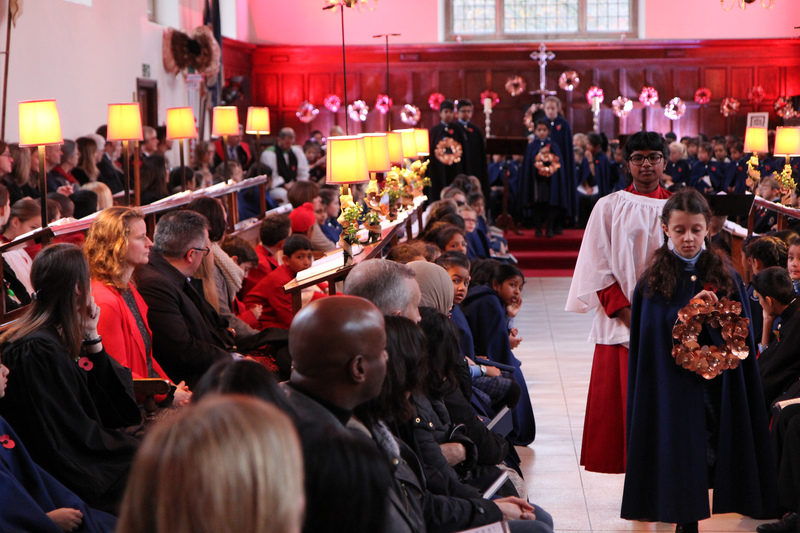 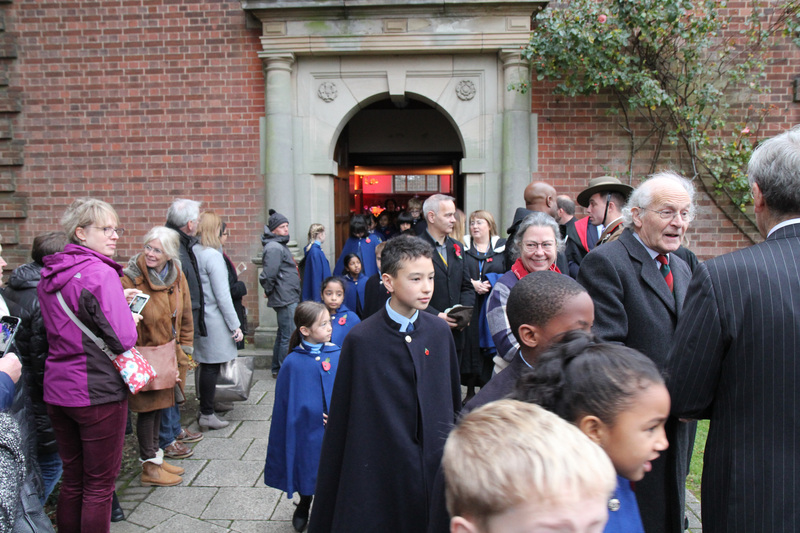 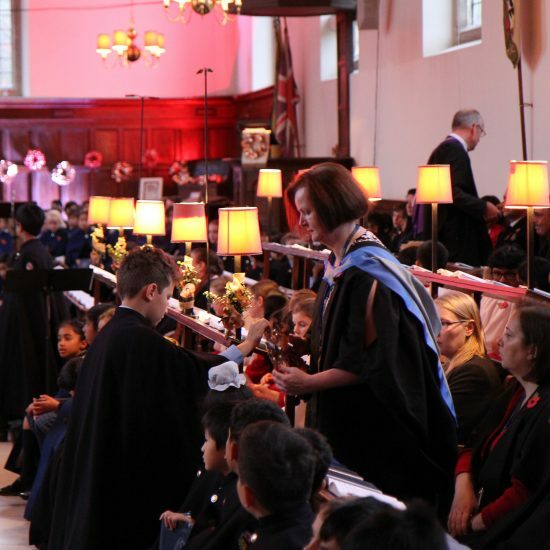 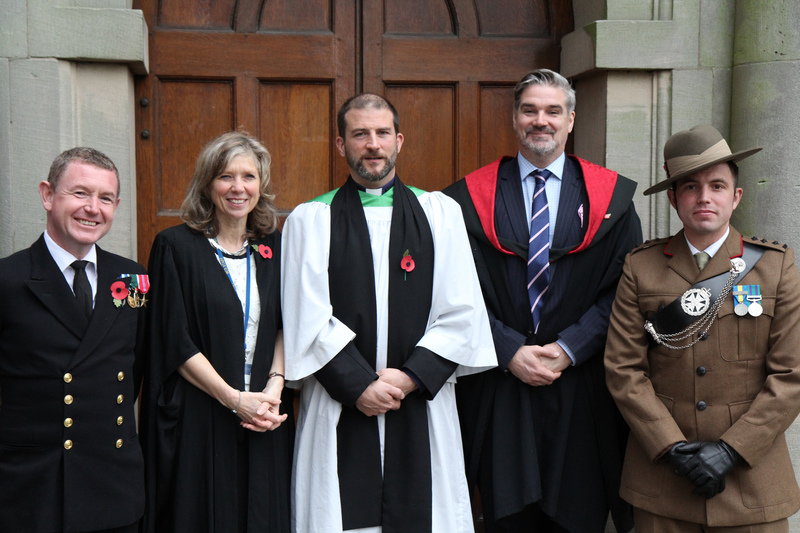 At our Remembrance Service this morning, the school community gathered together for a moving service of commemoration. 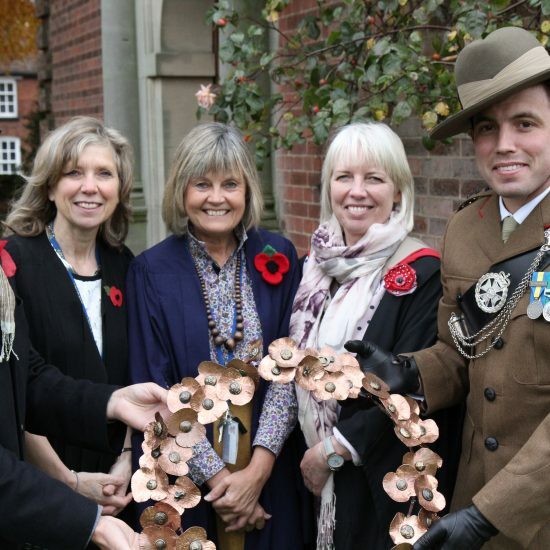 Amongst others, they particularly remembered two Blue Coat fallen – Private George William Kite, 9235, 2nd Battalion, King’s Shropshire Light Infantry who died on 08 January 1915, age 26. 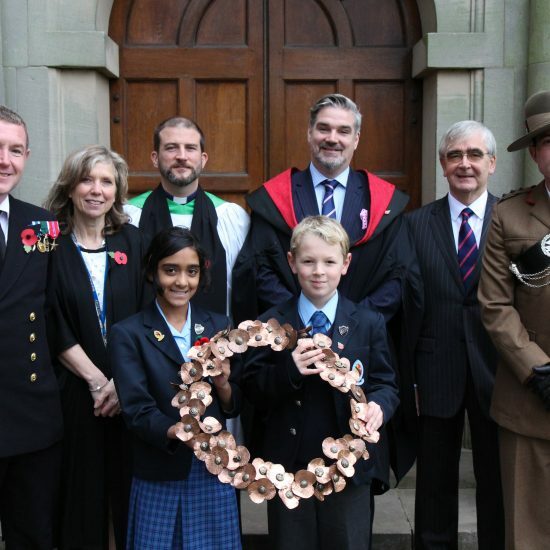 George was a Blue Coat pupil from 1875 to 1879 and is remembered at Menin Gate Memorial, Ypres. 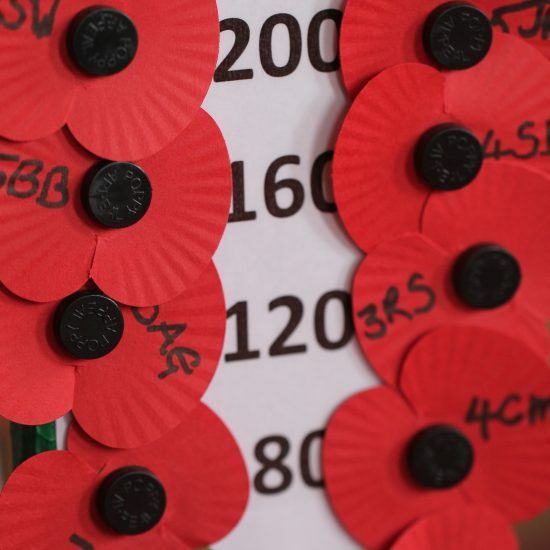 Also remembered with honour at the Arras Memorial is Sergeant Arthur Bath, 32512, 12th Battalion, Gloucestershire Regiment who died on 08 May 1917, age 32. 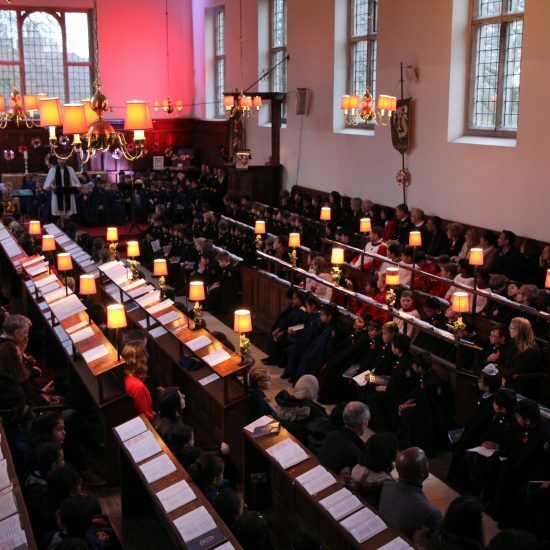 Arthur was a pupil from 1896 to 1899. 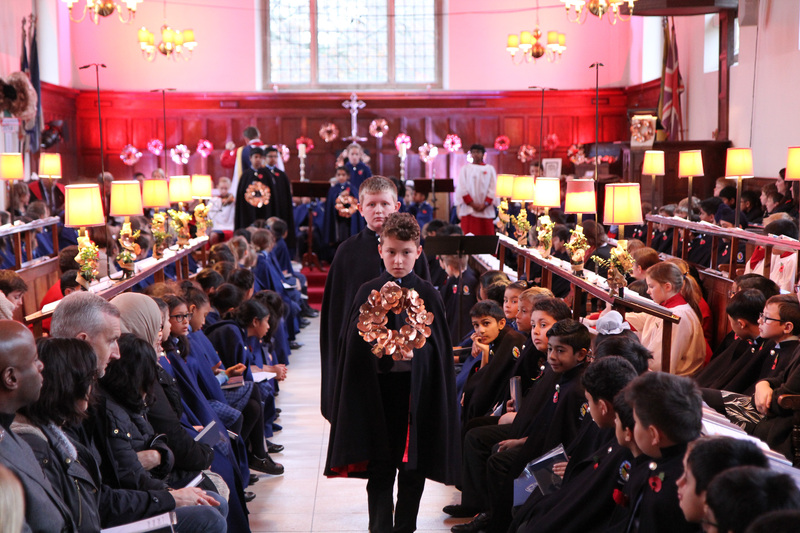 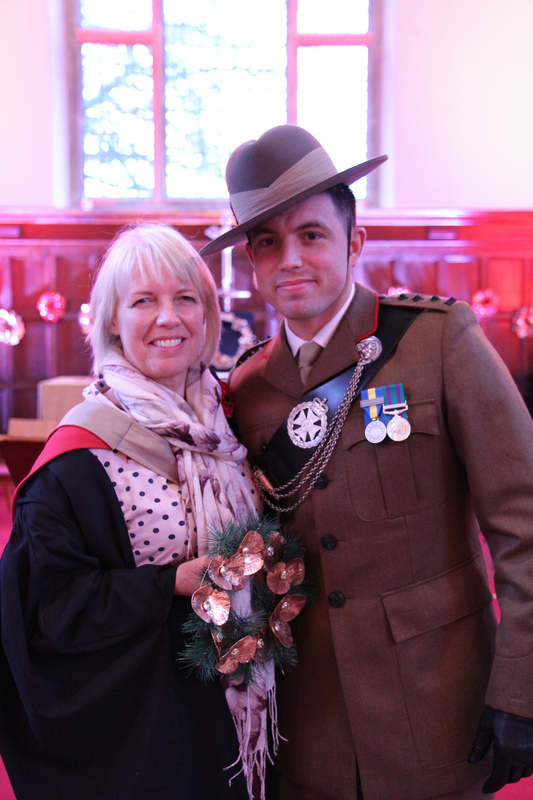 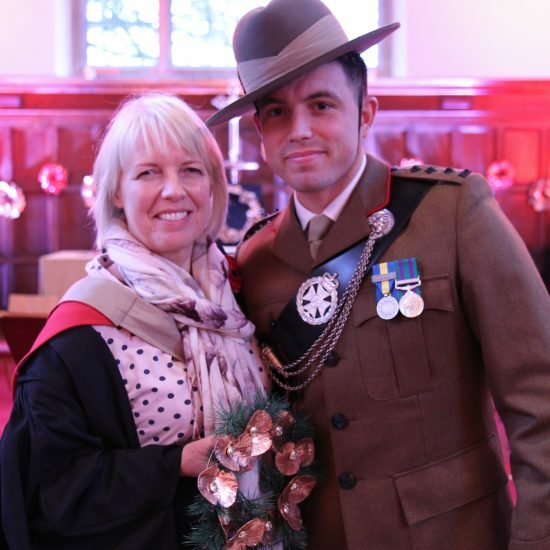 We were also delighted to welcome back Old Scholar Captain Philip Lambert, Royal Gurkha Rifles, (BCS pupil 1997-1999) to process our wreath down the aisle. 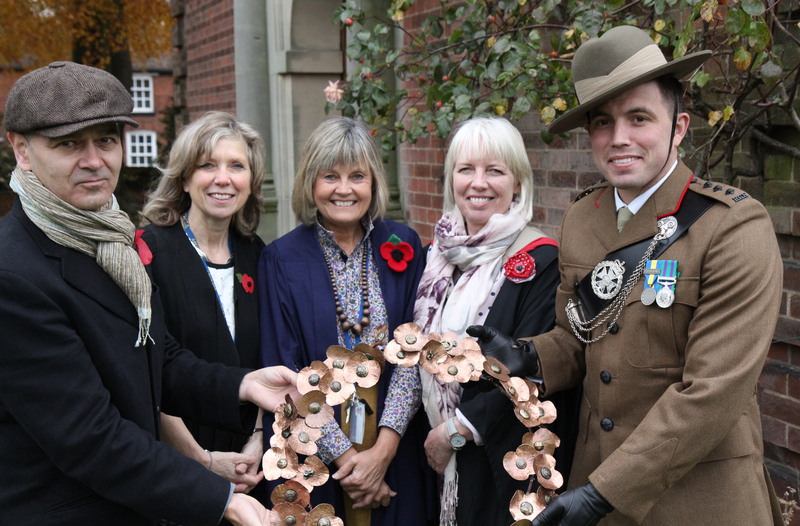 Our thanks go to Mrs Lambert-Green, Mrs Lynn, Ms Akehurst and Stephen Whitehead for their tireless work in bringing such a moving and inspirational project to Blue Coat. 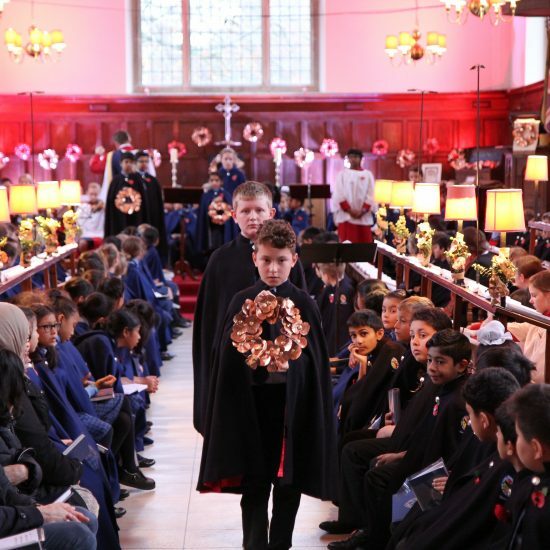 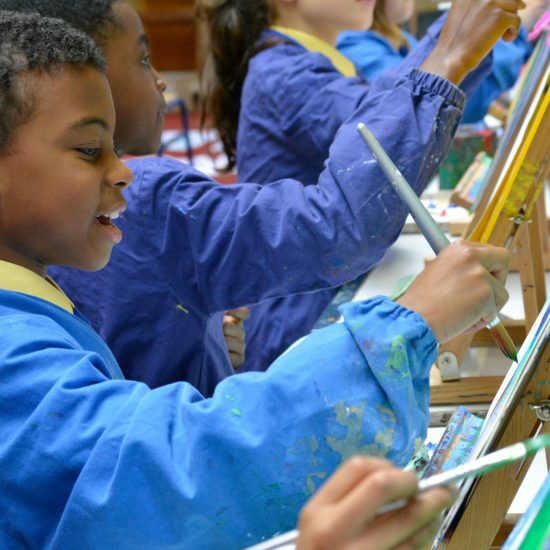 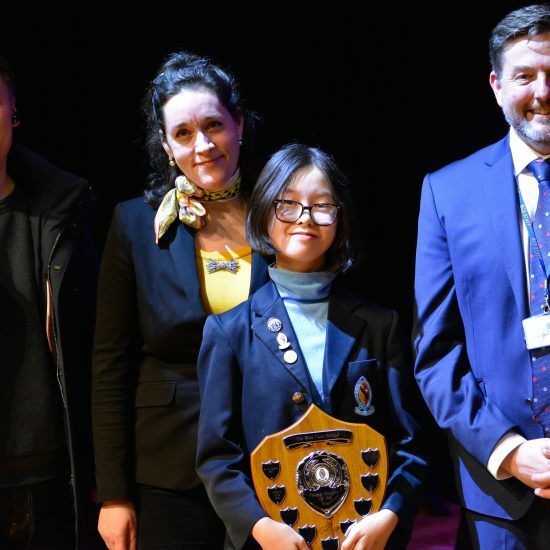 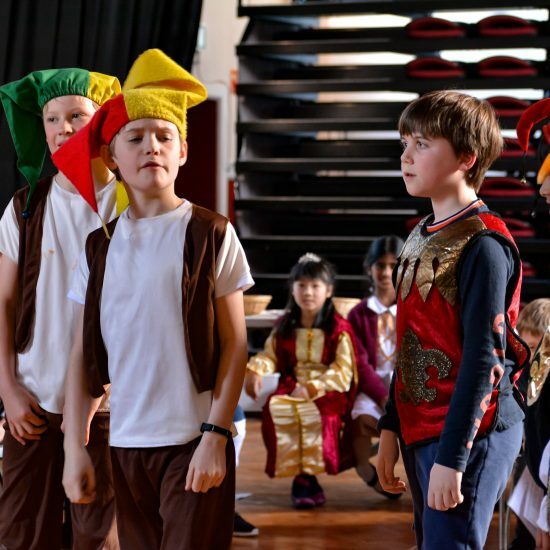 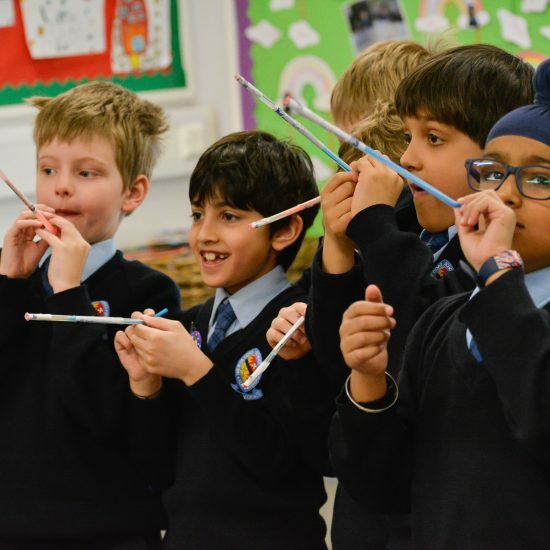 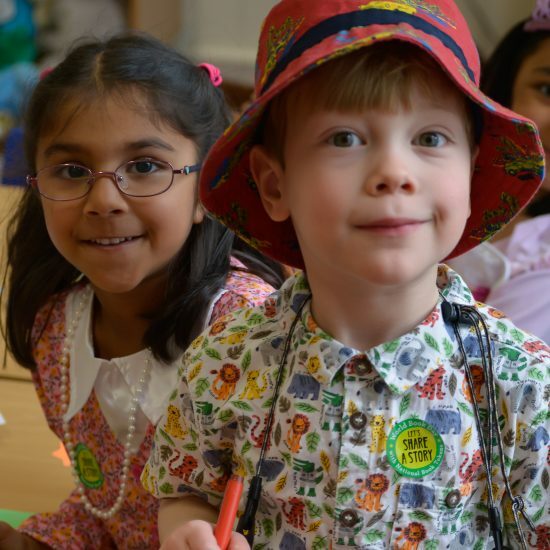 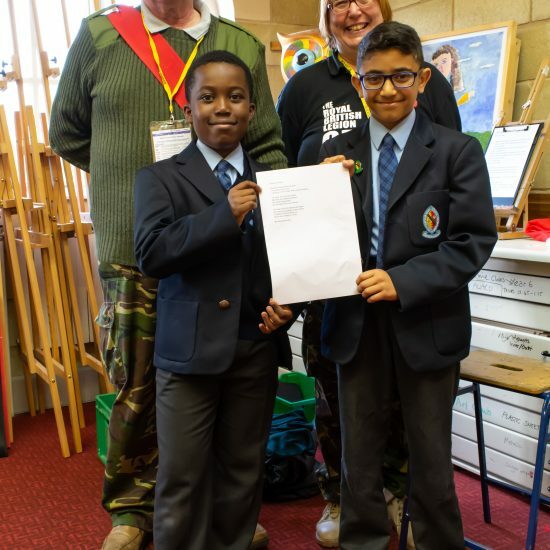 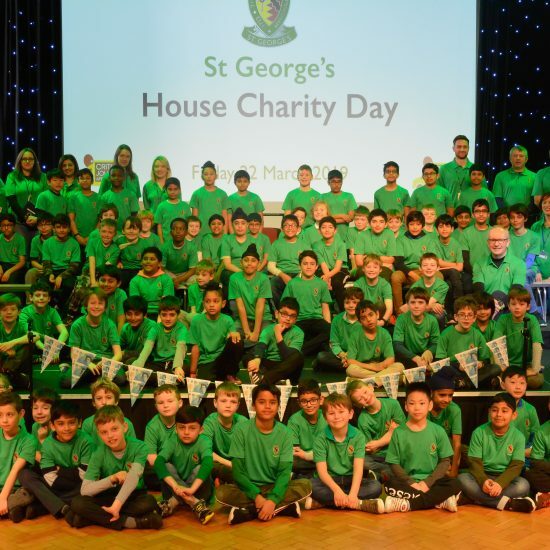 It has been a unique opportunity for the pupils to link art and history, to commemorate the stories and lives of World War One and to mark this important date in world history in such a special way.